Qualification Bars: No Photos. No problems. N.S. 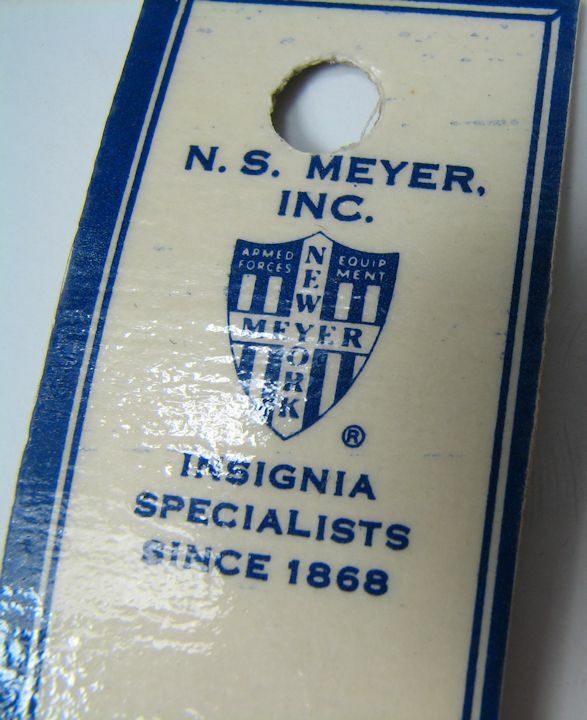 Meyer, 1/20 Silver filled. The bar (W for "wheeled", I believe) is marked G.I. followed by a diamond shaped design. Nuts are included. ARMY ACHIEVEMENT: Large medal missing. Box is faded on the outside. Pinback. 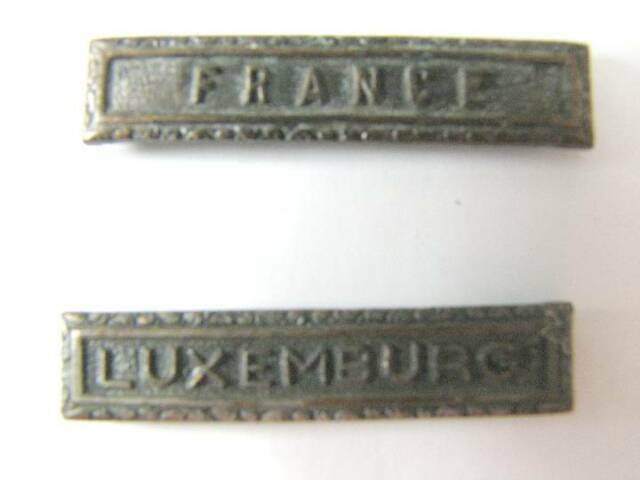 Both pieces are marked STERLING. 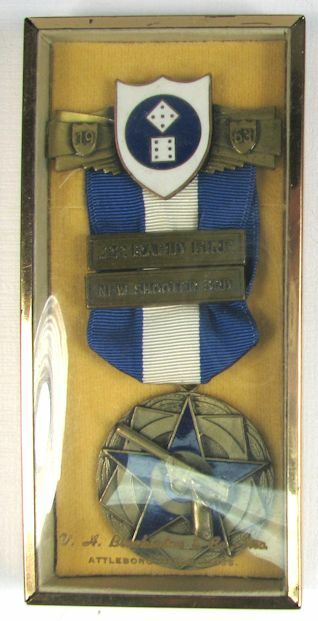 Sharpshooter Qualification Badge with Rifle and Grenade Bars: Clutchback, nuts included. 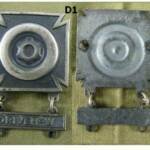 Badge is marked ANTAYA G.I. 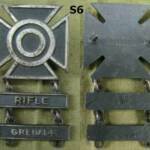 & Rifle bar is VANGUARD, both 1/20 Silver Filled The Grenade bar is marked STERLING. 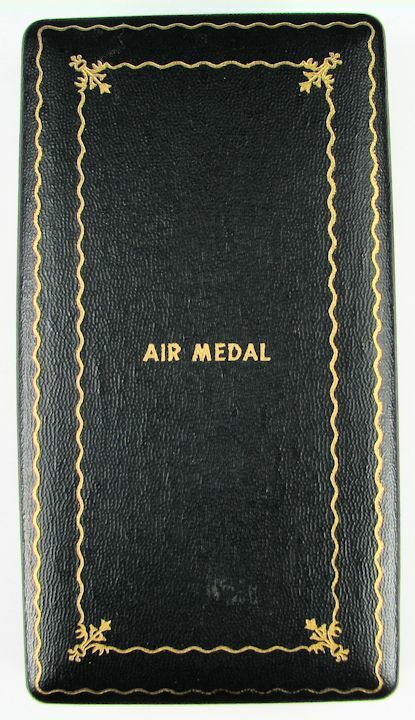 WW2 AIR MEDAL CASE with RIBBON PIECE: Nice case for a WW2 Air Medal. 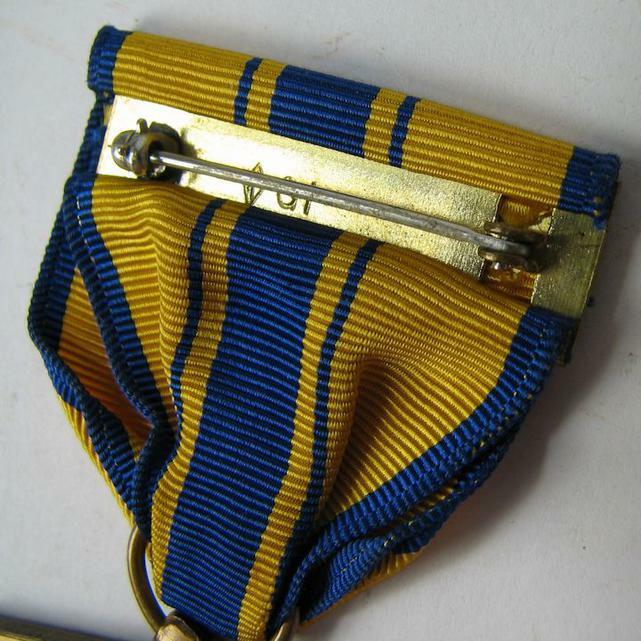 Includes a ribbon piece for the ribbon bar. Pinback. 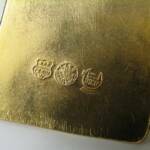 All 3 pieces are marked STERLING. Clutchback, nuts included. 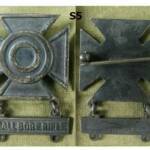 Badge and Grenade bar both marked N.S. MEYER and 1/20 Silver Filled. Pinback. 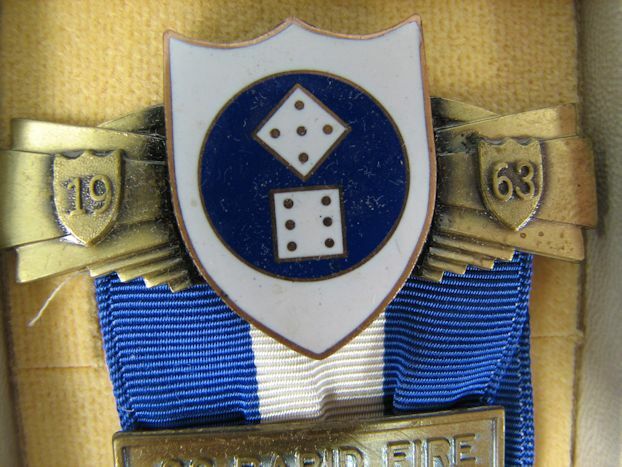 Badge marked STERLING. Bars are unmarked. Pinback. 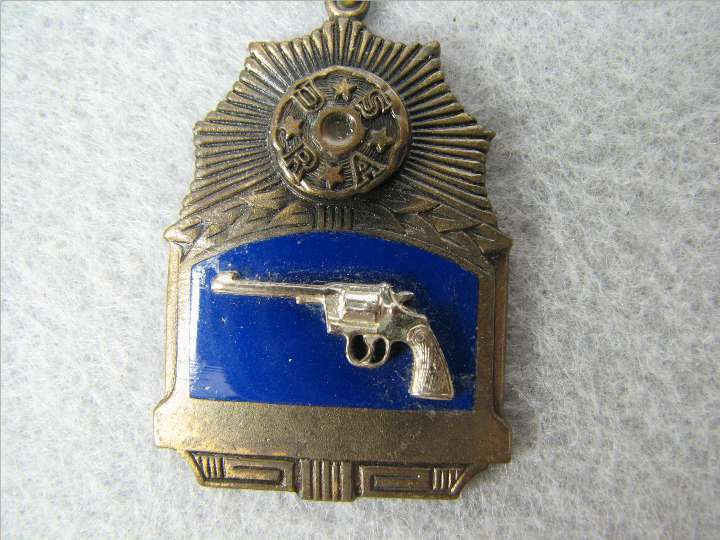 Both pieces are marked STERLING and the badge also has a Hallmark. Pinback. Neither piece is marked. 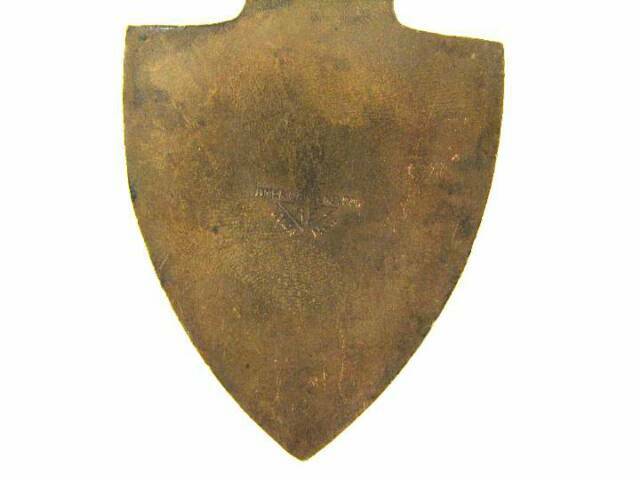 Has an unusual domed shape that may have been done in the field. Clutchback, nuts included. 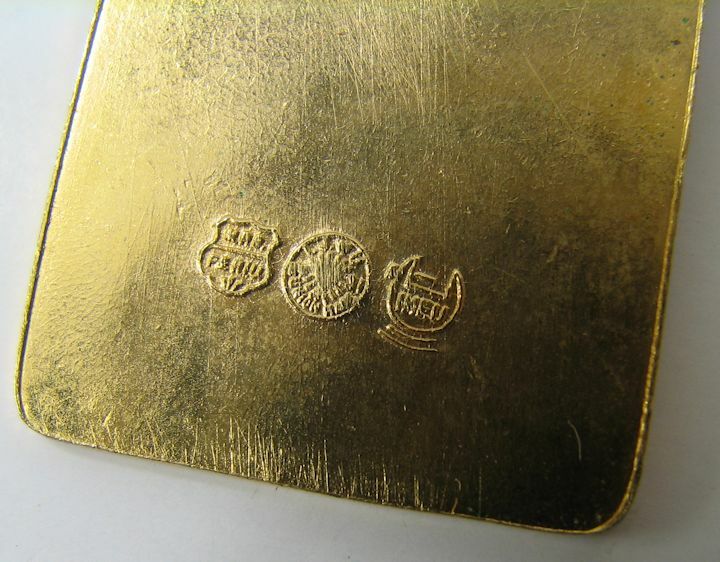 Hallmarked but unreadable. Clutchback, nuts are included. On the original red card. 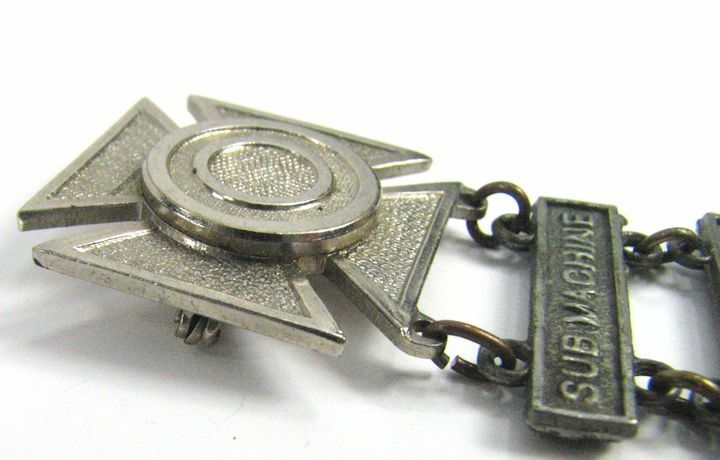 Hallmarked OLC 2-81. Clutchback, nuts are incuded. 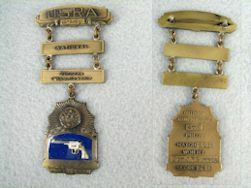 Hallmarked ANTAYA GI on the 2nd Award bar and H.L.P. 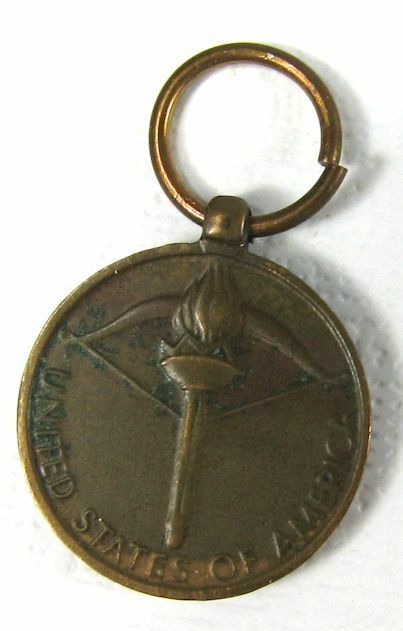 GI on the pendant. Clutchback, nuts are included. Has a 2nd award bar that is not attached. 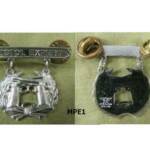 Hallmark KREW G-I on the pendant and V G-I on the 2nd award bar. (Combat Maneuver Training Center). Pinback. 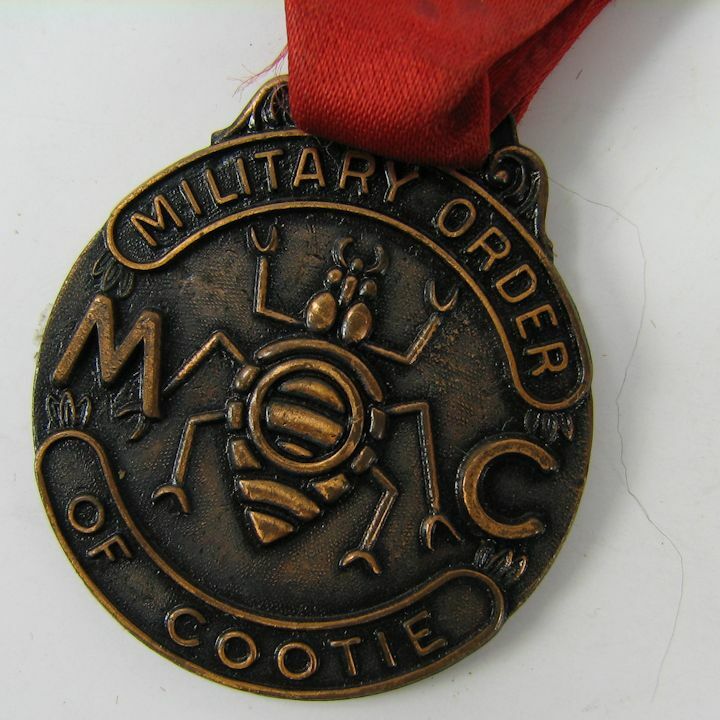 Military Order of the Cootie Medal BARS: I have a FRANCE and a LUXEMBURG bar for the Cootie Medal. 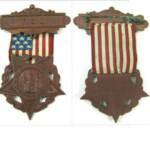 GAR Badge, 1880's: Membership badge for the "Ladies of the Grand Army of the Republic." Nice badge with no problems. 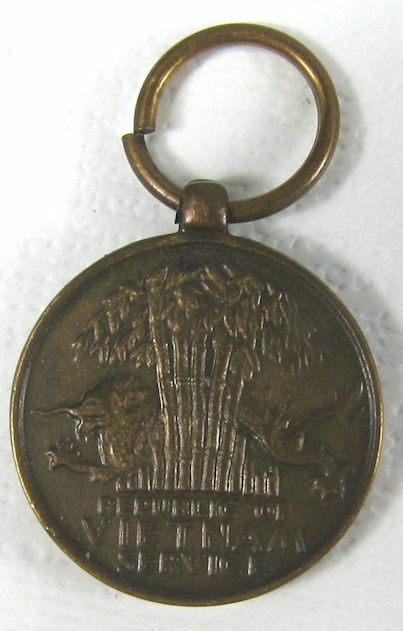 GAR Badge, 1880's: Membership badge for the "Woman's Relief Corps." Post-Civil War organization. 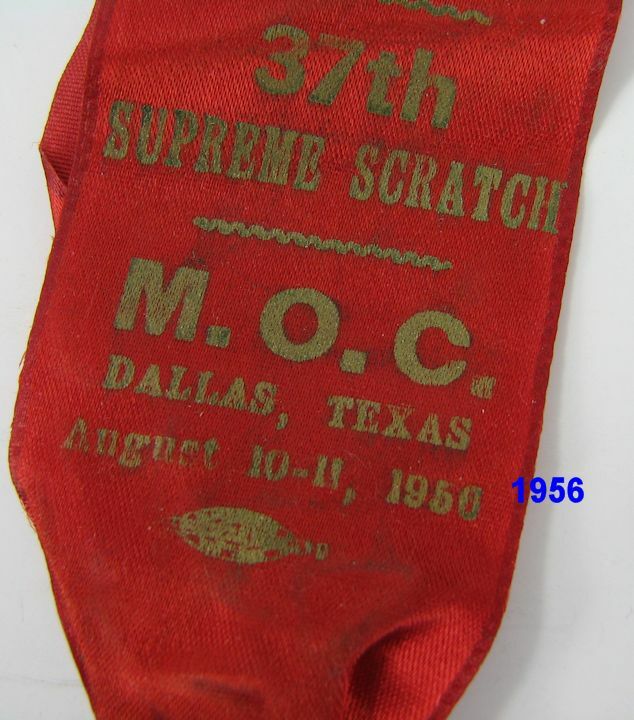 Nice badge with minor ribbon aging. 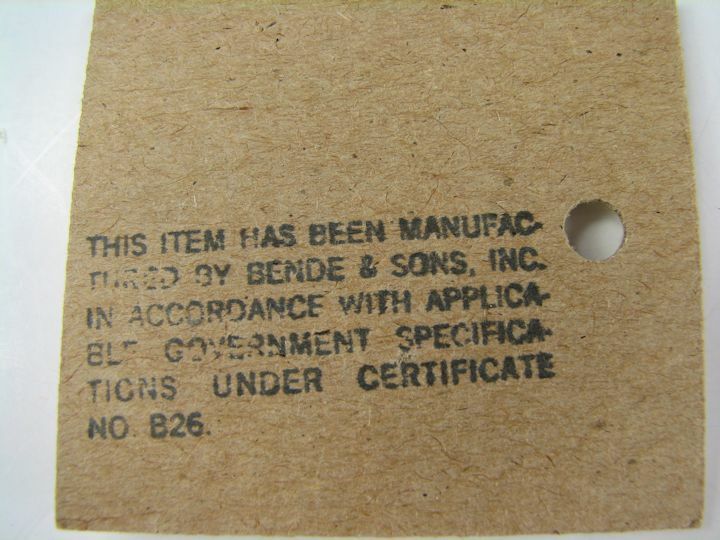 Patent dates on back are 1888. 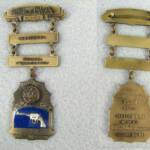 PASQUALE WW1 Sharpshooter Badge: The pin bar measures 1 3/4" wide and the pendant is 1 1/4" wide. 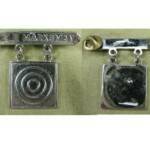 The pinbar is hallmarked PASQUALE S.F. 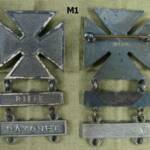 CAL and is marked SILVER. 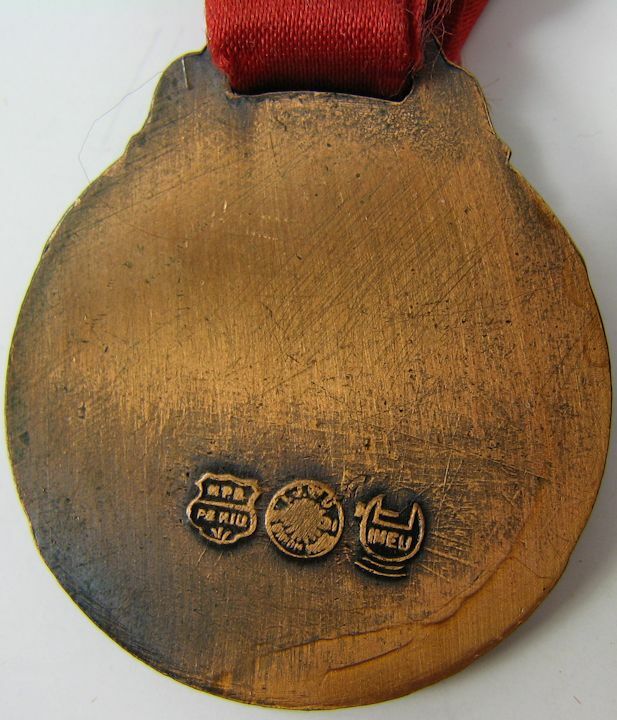 The pendant is also marked SILVER and it looks like it has gold wash over the silver. The name T.H.A. Tiedemann is on it. 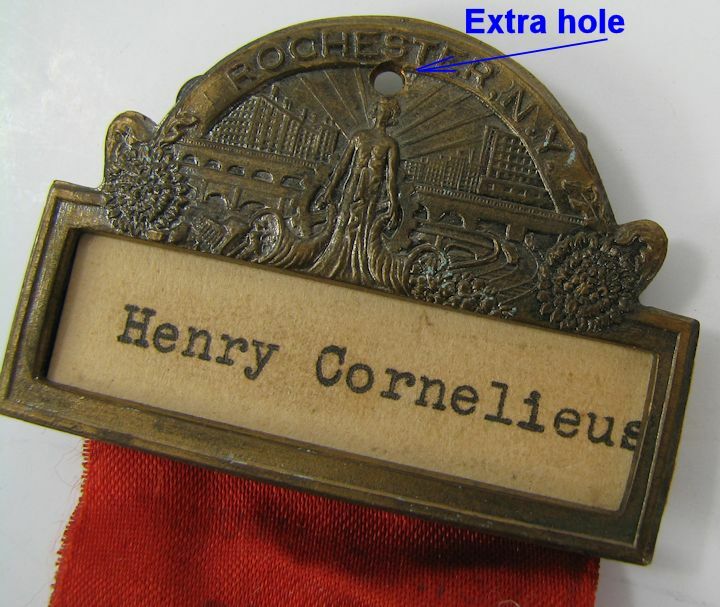 My brief and limited research found this: (Note the initials are not the same). 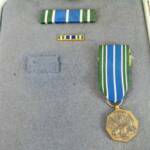 I found another California National Guard listing for Tudor H.A. Tiedemann. 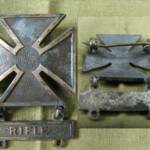 Division Adjutant. (California National Guard). 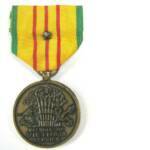 Army National Guard Achievement Medal: With clutchback ribbon bar. 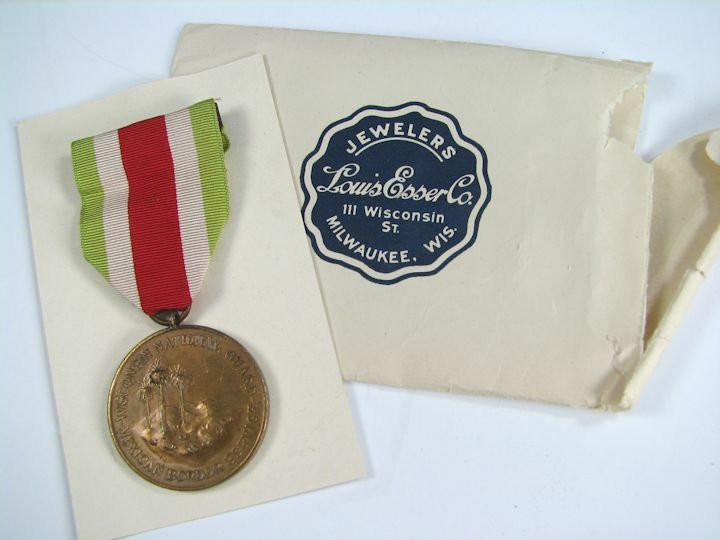 WWI Victory Medal: Pretty nice condition. 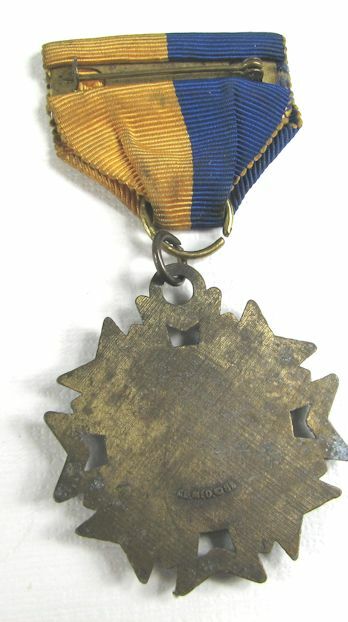 Early small ribbon medal. 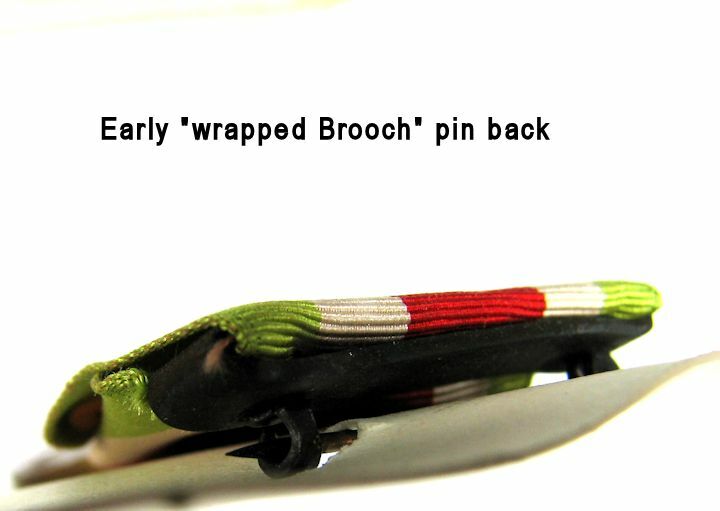 Wrapped brooch. 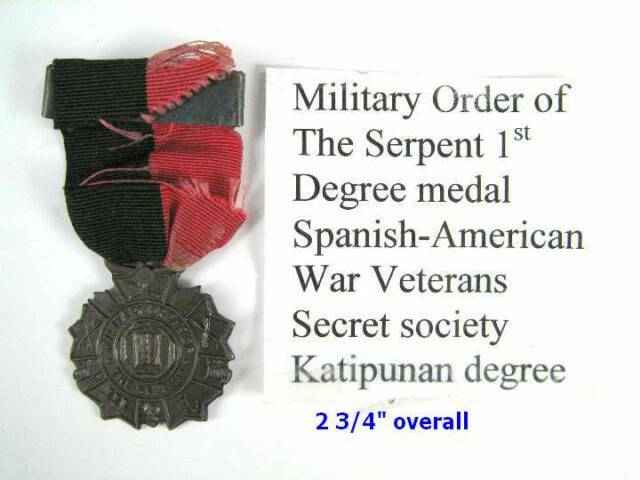 MILITARY ORDER OF THE SERPENT: Spanish-American War veteran's secret society medal. 1st Degree. All there but the ribbon is torn at the brooch. 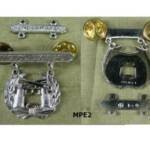 Overall length is 2 3/4". No hallmark. Probably from the 1920's. 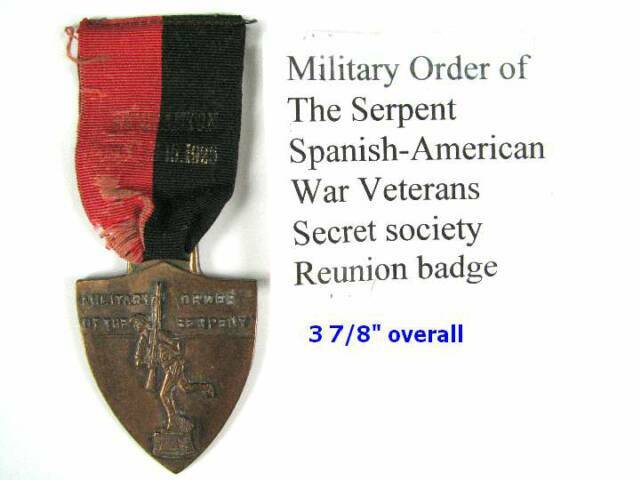 MILITARY ORDER OF THE SERPENT: Spanish-American War veteran's secret society 1925 Reunion Badge from Binghamton. 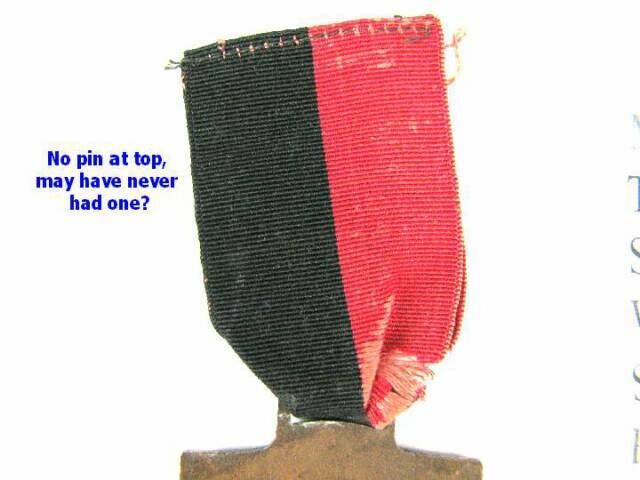 No pin at top; may never have had one? Hallmarked on the back. 3 7/8" overall length. 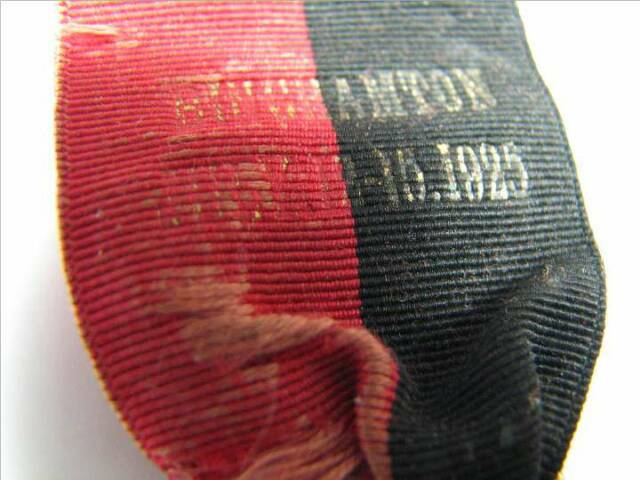 Ribbon dated with a readable 1925. 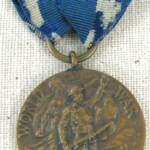 WW1 medal issued by the State of New York. 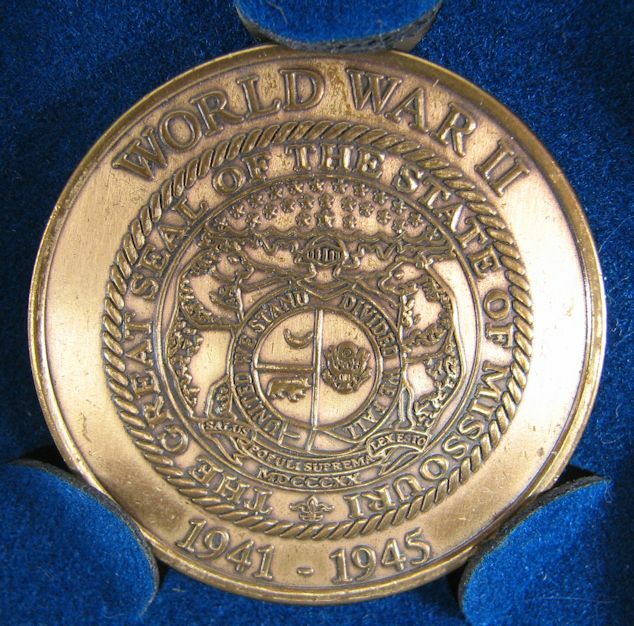 It says on the front: WORLD WAR. 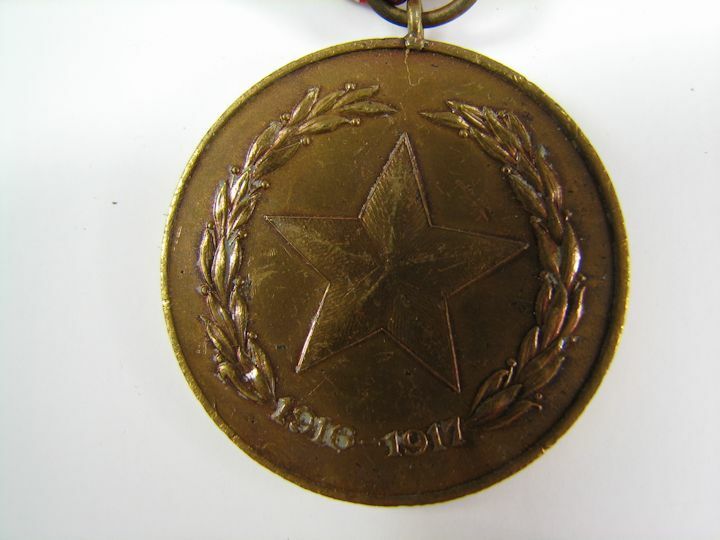 On the back is: FOR SERVICE 1917-1919 PRESENTED BY THE STATE of NEW YORK. 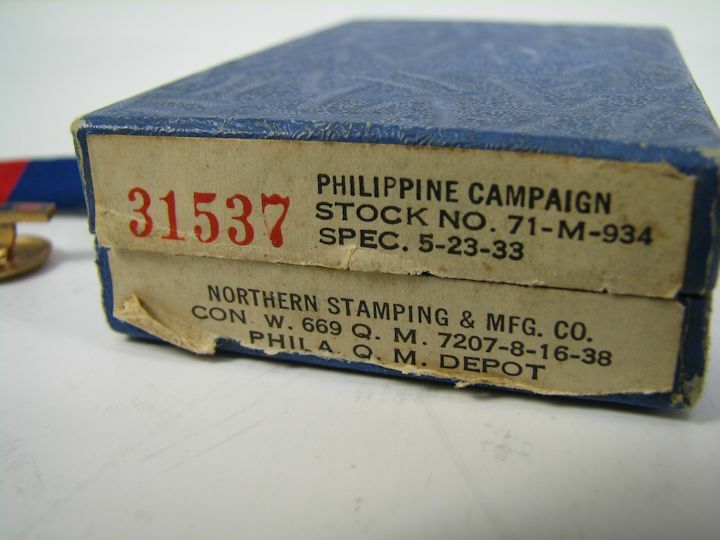 It is also numbered on the back at the top: 40595. 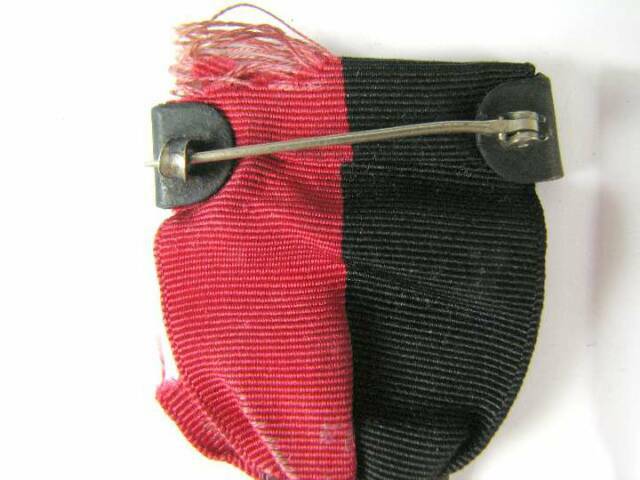 The ribbon exhibits wear and tear and the slotted brooch has came unsewn at the two holes (easily reattached). The catch for the pin is broken but the pin is still there. Please view the photos for condition. 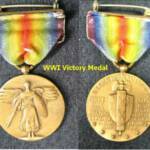 WW1 Victory Medal with FRANCE clasp: Original WW1. 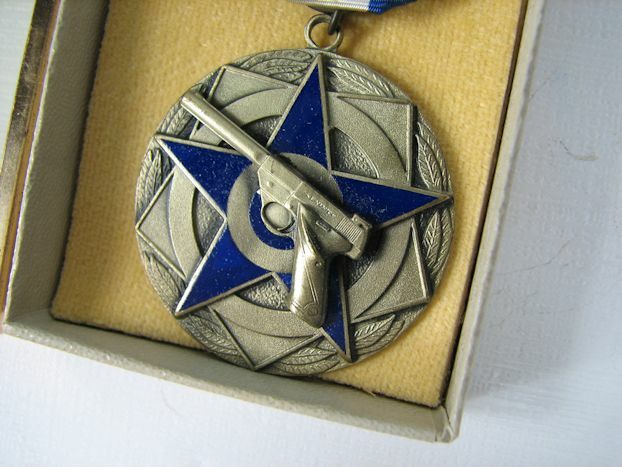 1946 U.S. REVOLVER ASSOCIATION SHOOTING AWARD: Won by Sgt. J.P. Sumner. 4th place. 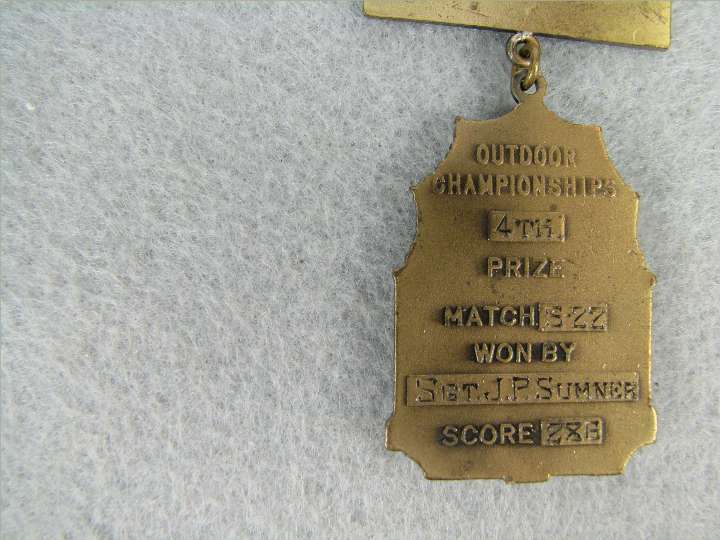 Nice medal. 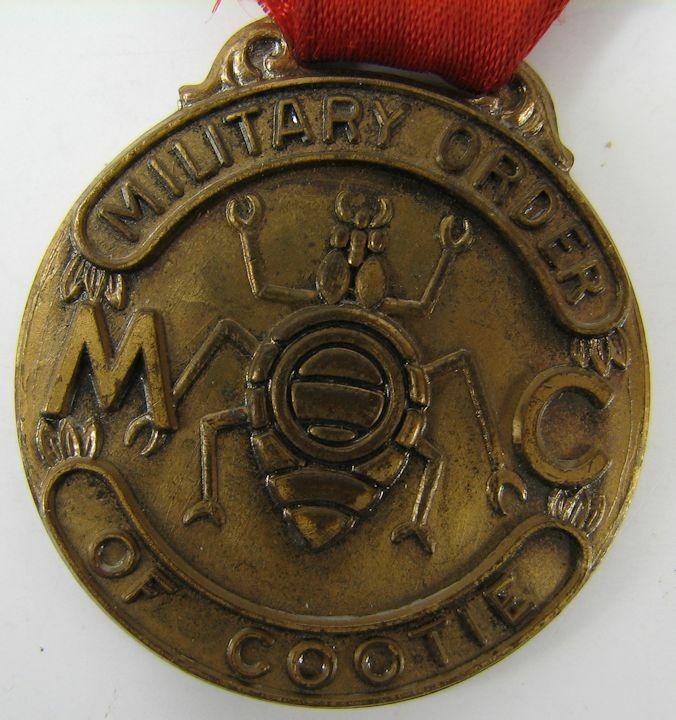 MILITARY ORDER OF THE COOTIE: 1 1/2" diameter brass or copper medalion HONOR DEGREE, MILITARY ORDER OF THE COOTIE. Nice condition. 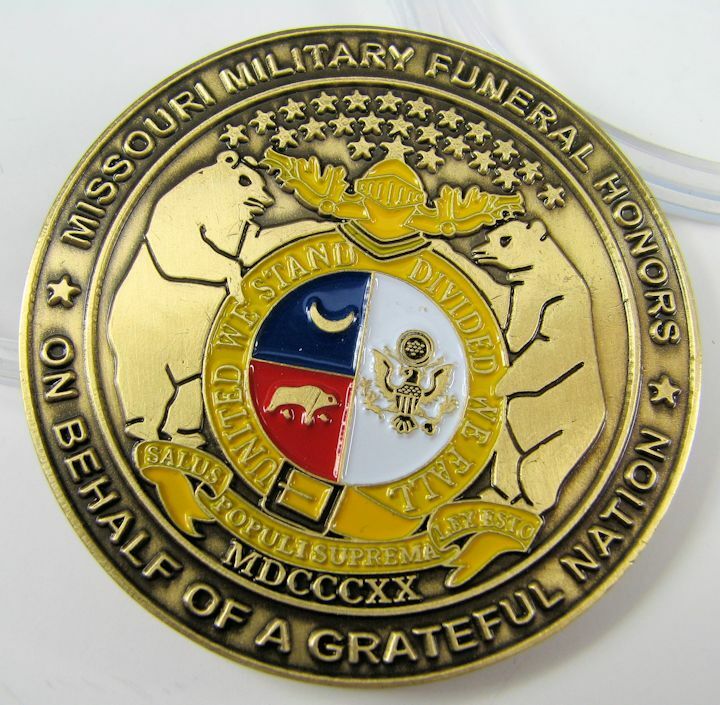 MISSOURI VET'S FUNERAL TOKEN: Given to the family of the deceased vet in honor of his service. 1 3/4" Diameter. 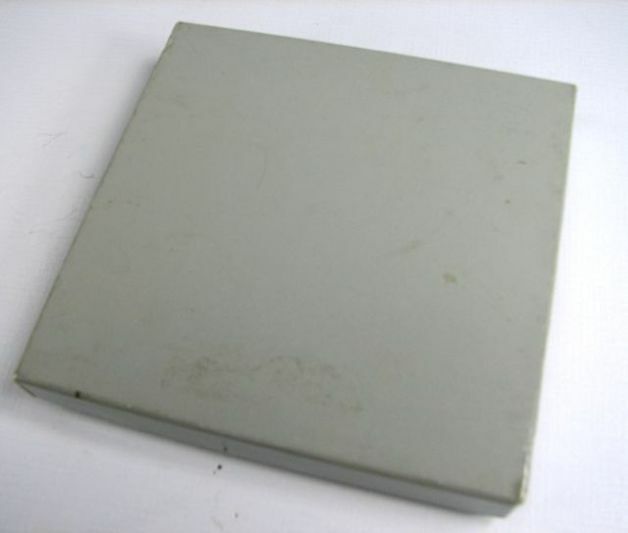 It is in a plastic case. 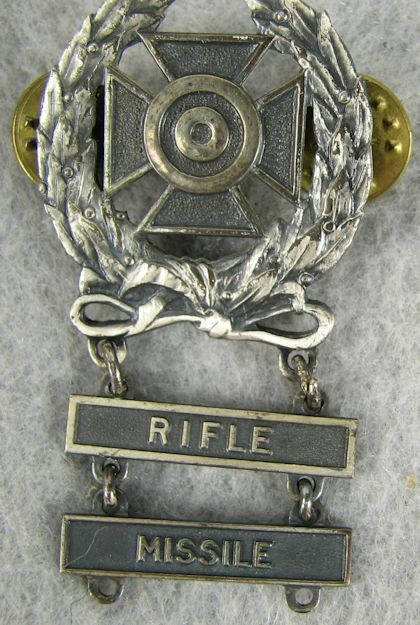 Expert Qualification badge with rifle bar. 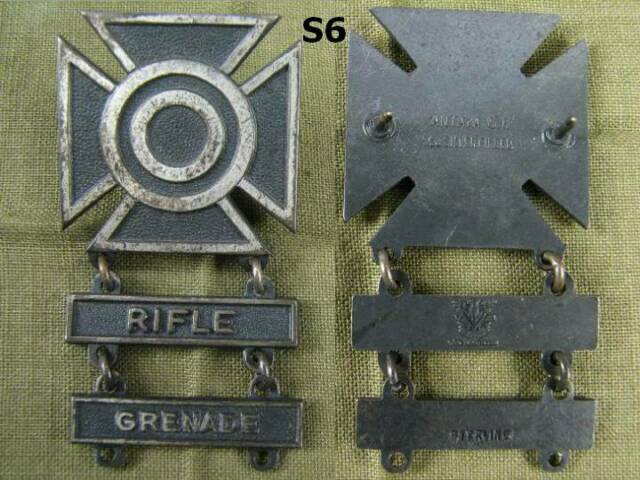 Both are marked STERLING. 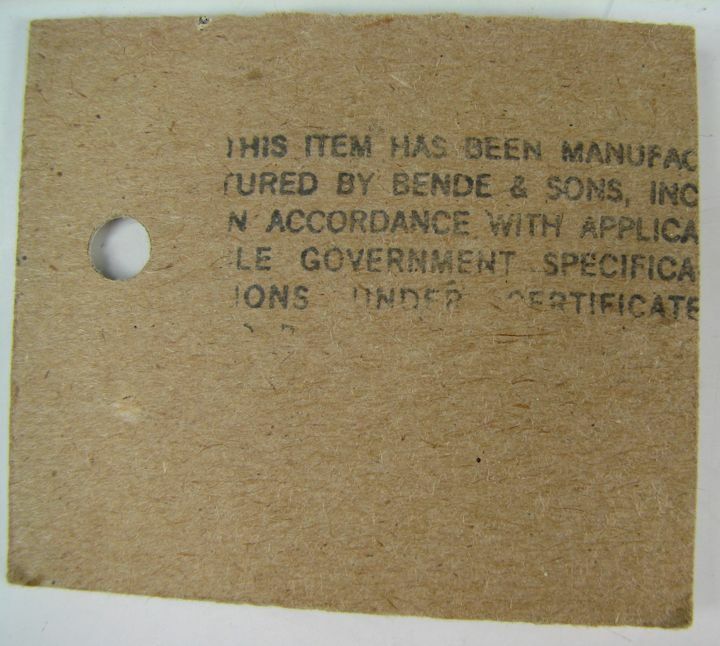 On the original card. Time period unknown but it is newer type brooch. 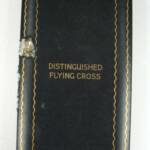 DISTINGUISHED FLYING CROSS CASE: Damage at left edge. Inside is nice. 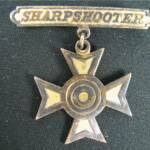 Sharpshooter Qualification Badge has the raised, two piece target from Pre-War use. Pin back. Bars are cast lead. Hard to find item. 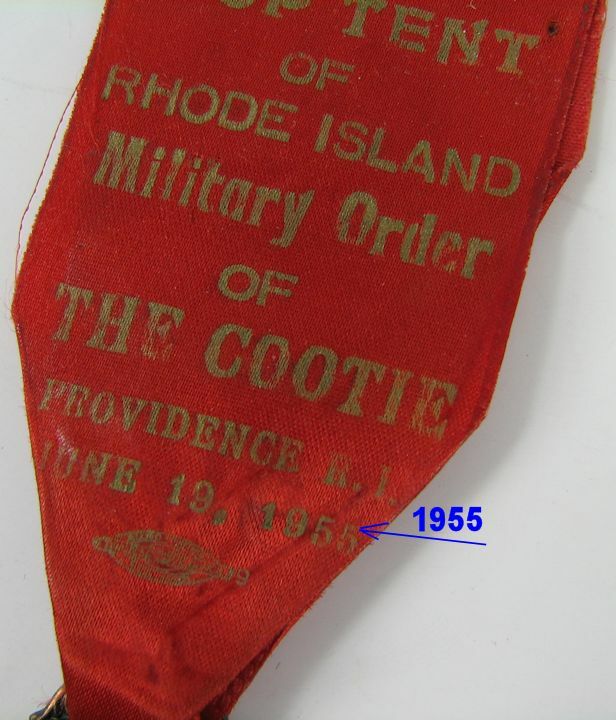 MILITARY ORDER of the COOTIE: Convention, "Grand Pup Tent", Rochester, NY 1950. 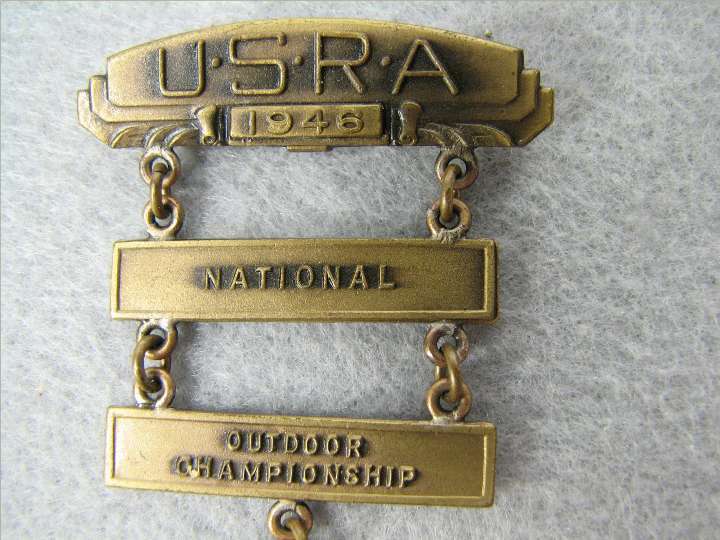 Named medal. 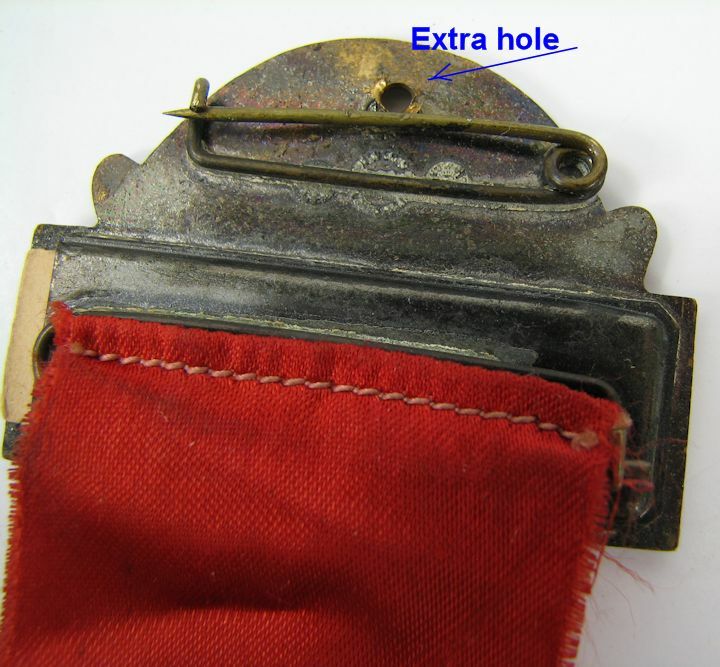 Extra hole in the top pin bar. 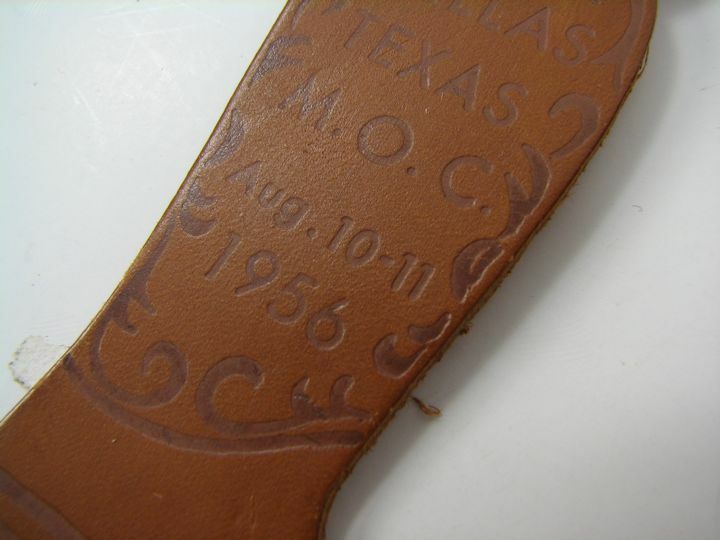 Hallmarked on the back "BASTIAN BROS. CO." The M.O.C. 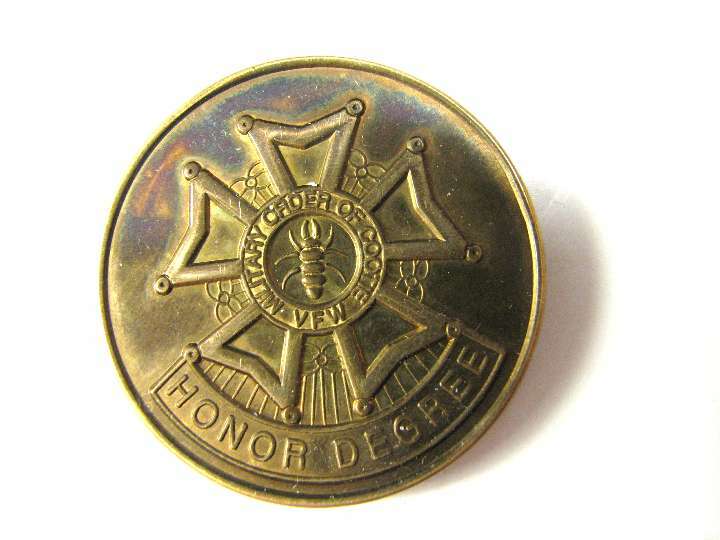 was an HONOR SOCIETY of the V.F.W. 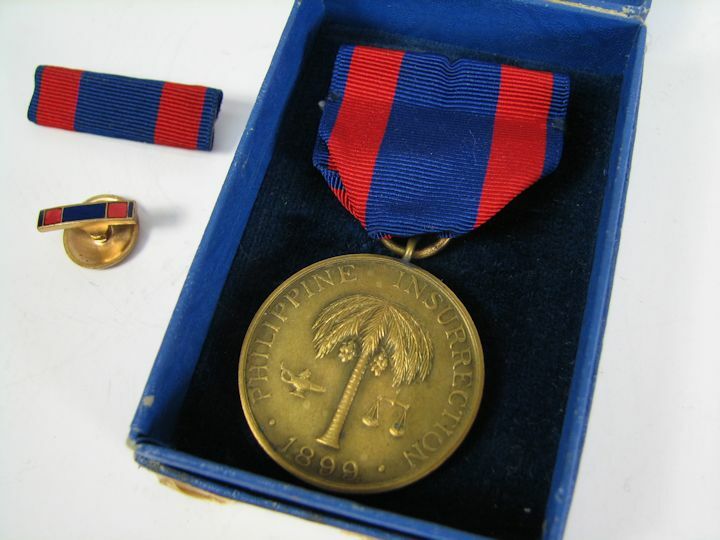 You can read about them here: http://lotcs.org/history.html Nice medal. 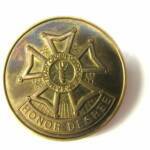 MILITARY ORDER PURPLE HEART, 14K GOLD: This lapel pin has across the top DEPARTMENT PAST COMMANDER. Below the image are the dates 1782-1932. And across the bottom is MILITARY ORDER PURPLE HEART. 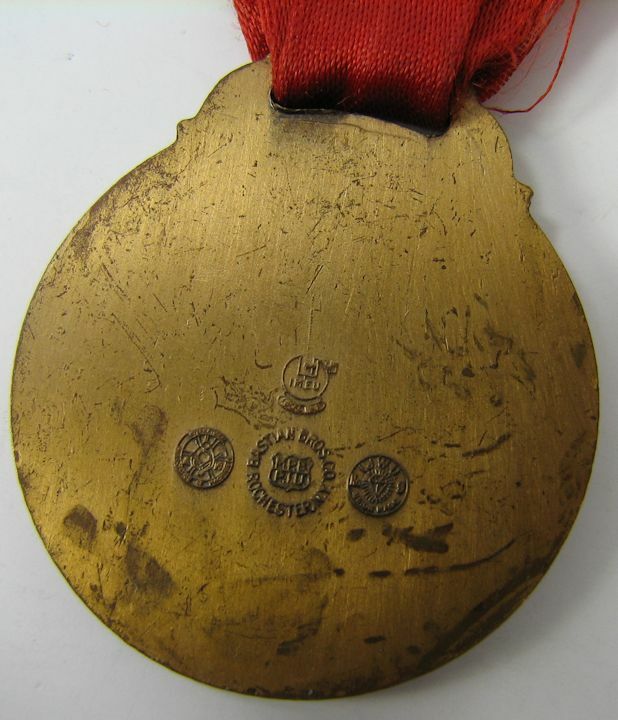 It is made of 14K gold and it weighs 2.4 grams. WW2, NAVY UNIT COMMENDATION: 3/8" size, plastic covered, pinback. Nice. 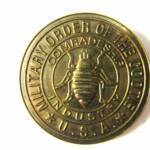 CONSTITUTION, BY-LAWS, RULES AND REGULATIONS of the MILITARY ORDER of the PURPLE HEART. 1947. 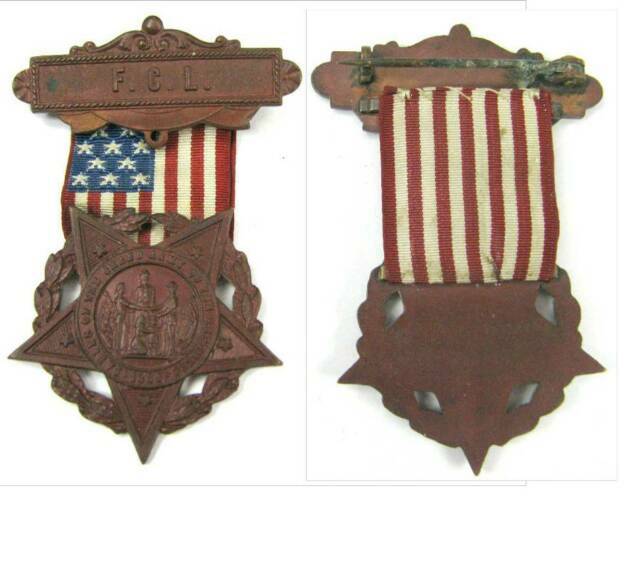 Pre-WW1, NAMED, U.S.NAVY GOOD CONDUCT MEDAL GROUP: Consists of the 1916 dated Good Conduct Medal from the U.S.S. 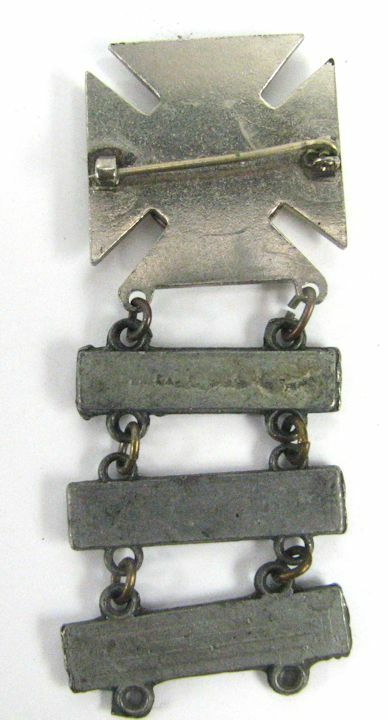 WADSWORTH; a1922 dated clasp from the U.S.S. 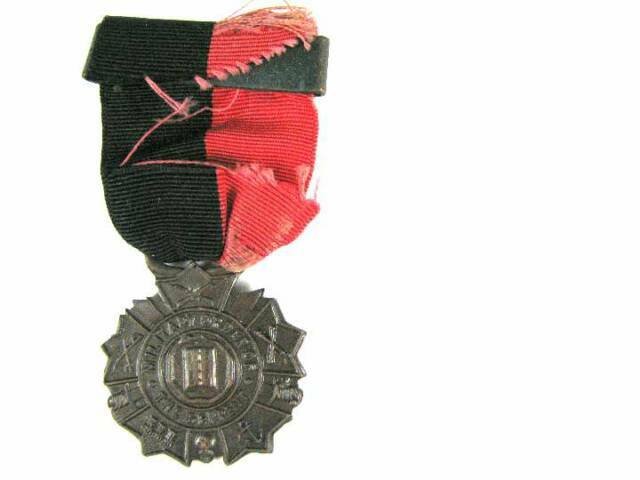 Lansdale; a Mexican Service and Haitian Campaign 1/2" pinback ribbon bar; a WW1 Victory Medal with DESTROYER clasp and the 3/8" sewn on, pinback WW1 ribbon bar. Also some research information for the years 1917-1918, ealier research needed. 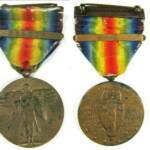 All items are in very good condition except for the WW1 Victory medal which has a torn ribbon. 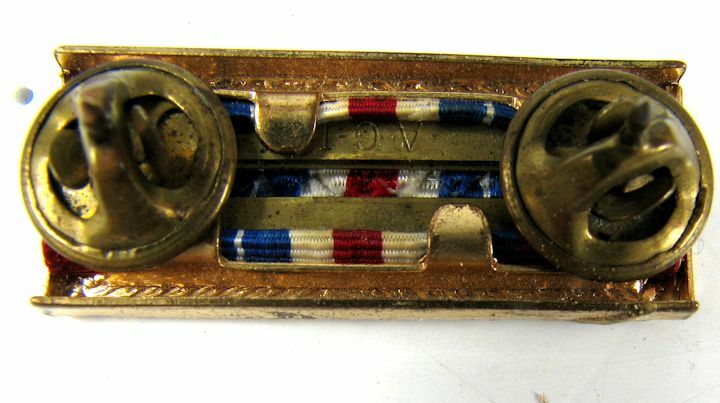 WW2, AMERICAN CAMPAIGN RIBBON BAR: Four available, all pin back. All nice ribbon bars. Priced each. 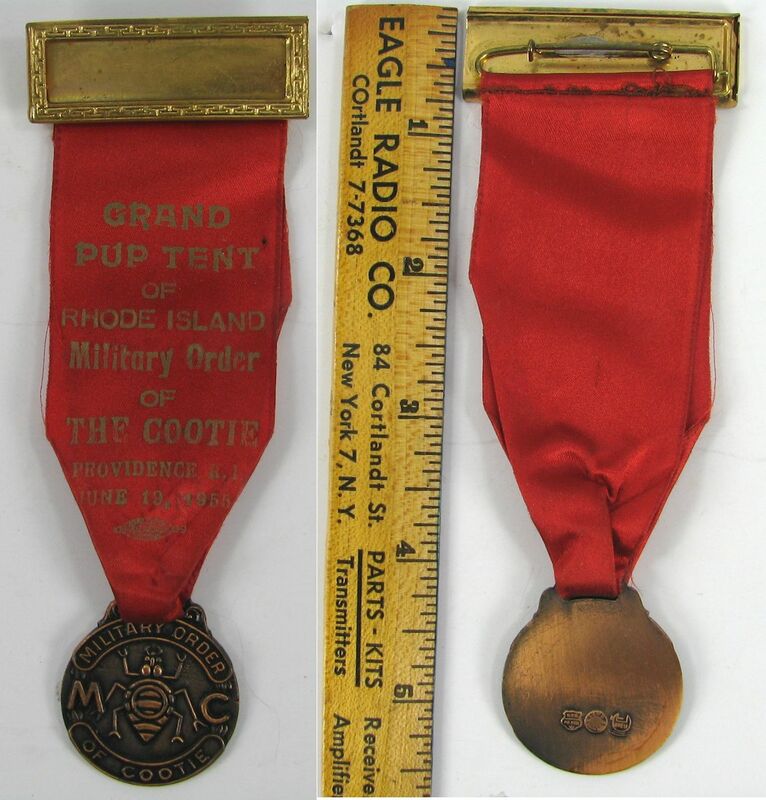 GOOD CONDUCT RIBBON BAR AND LAPEL BUTTON: Ideal to complete the cased GCM set. 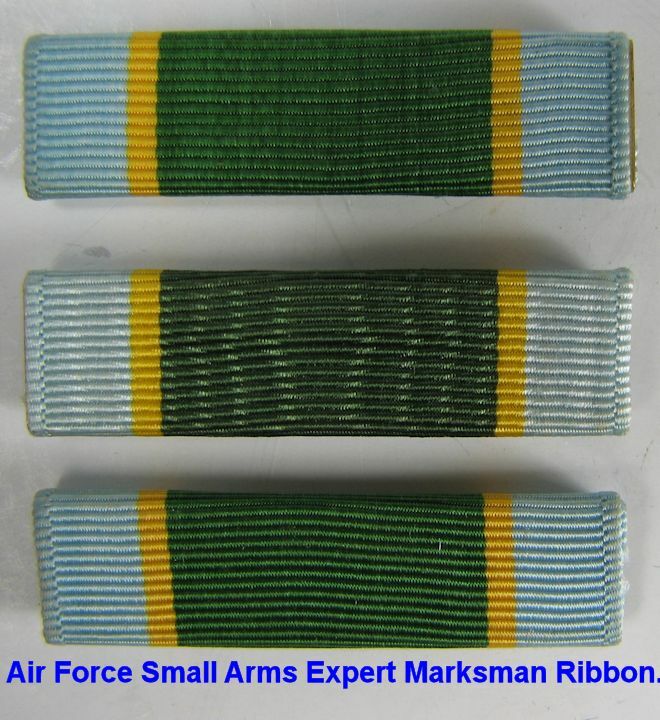 Ribbon bar is pinback. 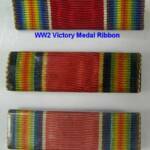 WW2, VICTORY MEDAL RIBBON BAR: Three available. 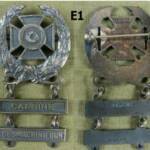 One has the pin back fastener. 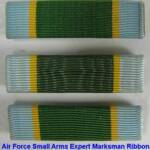 USAF SMALL ARMS EXPERT MARKSMAN RIBBON BAR: Three available. 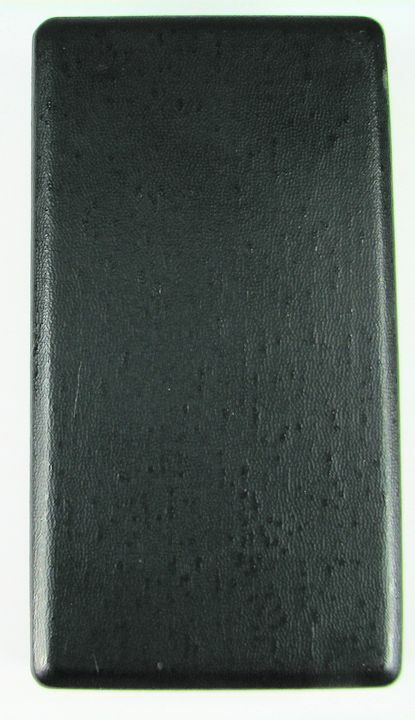 All slide-on, no pin backs. 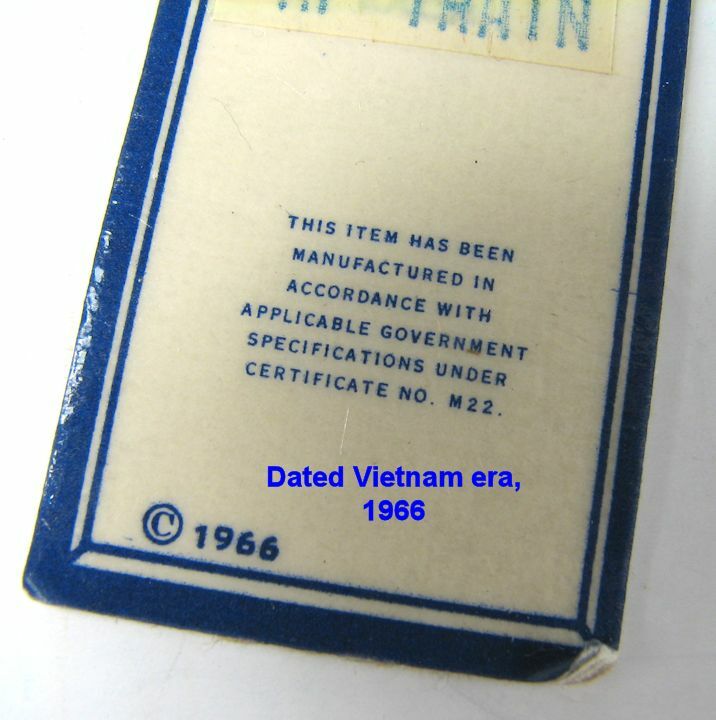 Vietnam era. 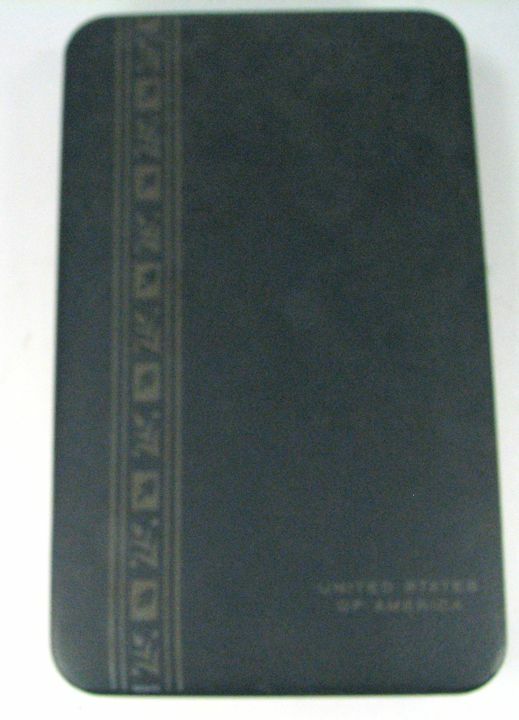 Item # 216009 $2.00 each. AIR FORCE SMALL ARMS EXPERT MARKSMAN RIBBON BAR, ON ORIGINAL CARD: New-Old-Stock. 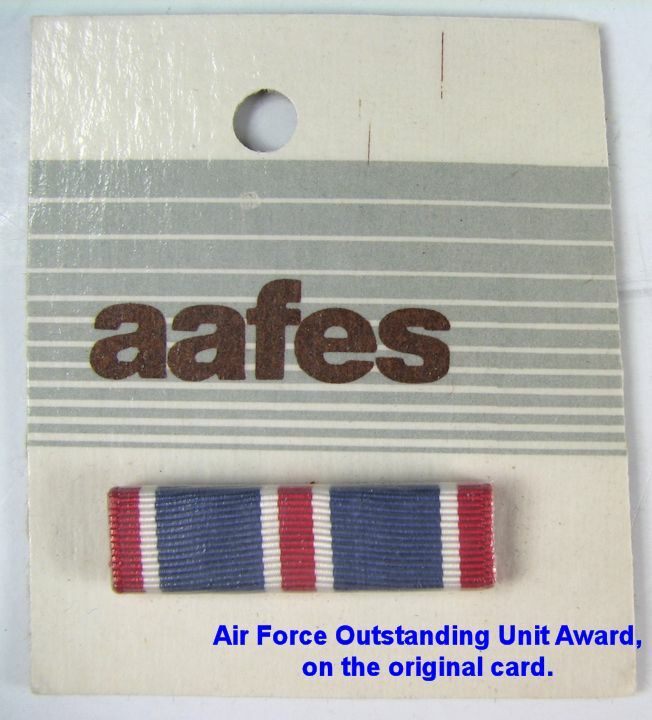 USAF OUTSTANDING UNIT AWARD, ON ORIGINAL CARD: New-Old-Stock. 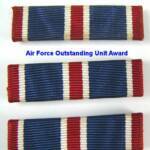 AIR FORCE OUTSTANDING UNIT AWARD RIBBON BAR: Three available. Slide-on. Item # 216013 $2.00 each. 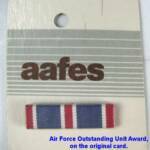 AIR FORCE OUTSTANDING UNIT AWARD, ON ORIGINAL 1966 COPYRIGHT CARD: Two available. Cards show some bending from the years. New-Old-Stock. 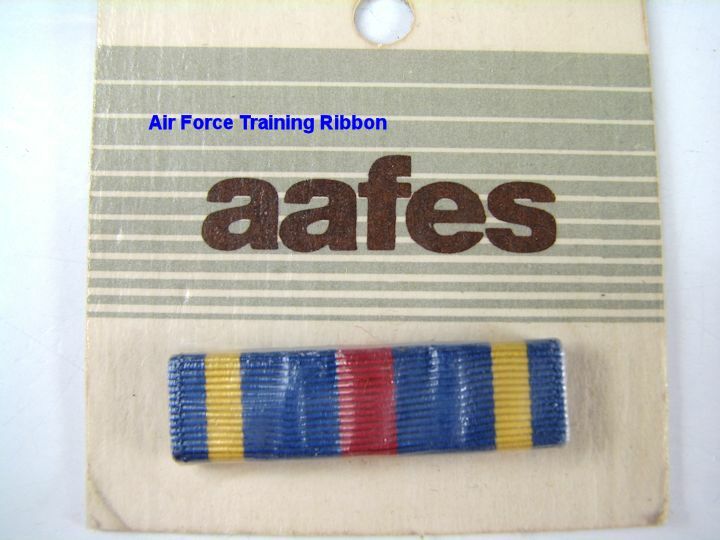 AIR FORCE TRAINING RIBBON, ON ORIGINAL 1966 COPYRIGHT CARD: N.S. Meyer, New-Old-Stock. 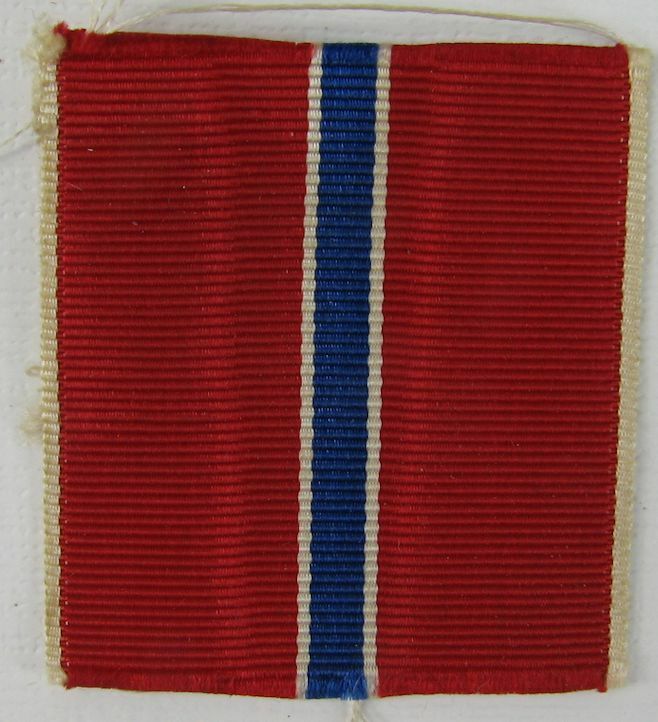 NAVY AND MARINE'S OVERSEAS SERVICE RIBBON, ON ORIGINAL VANGUARD CARD: Card is in poor condition. Card says: "U.S.N./USMC O'SEA". New-Old-Stock. 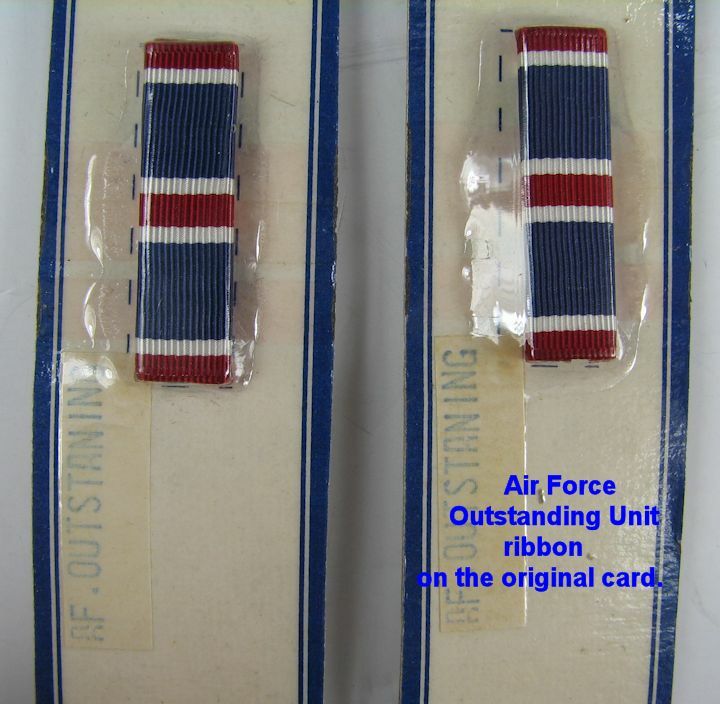 AIR FORCE TRAINING RIBBON, ON ORIGINAL CARD: New-Old-Stock. 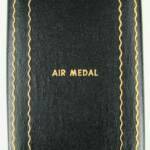 AIR FORCE GOOD CONDUCT RIBBON: Two available. 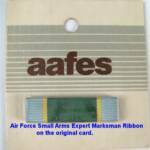 On original aafes cards. 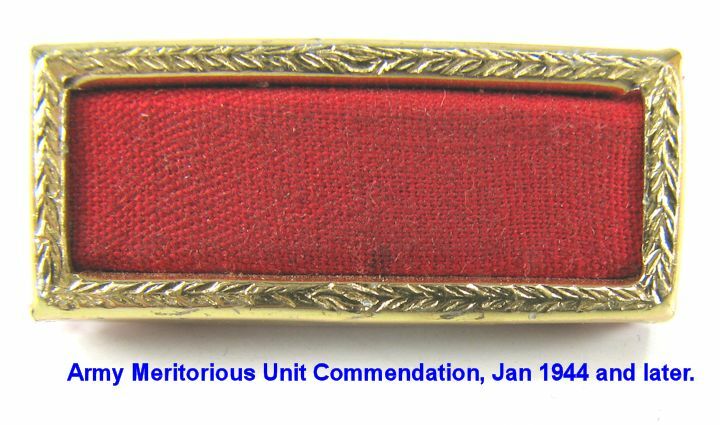 ARMY MERITORIOUS UNIT COMMENDATION: Large 5/8" frame. 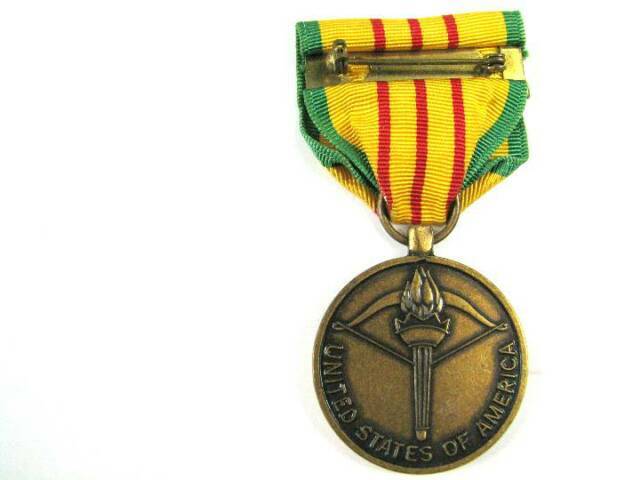 ARMY SUPERIOR UNIT AWARD WITH OAK LEAF: Large 5/8" frame,. 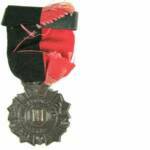 VALOROUS UNIT AWARD: Large 5/8" Army size. Some 'stuff' stuck on it that should pick off, see photos. 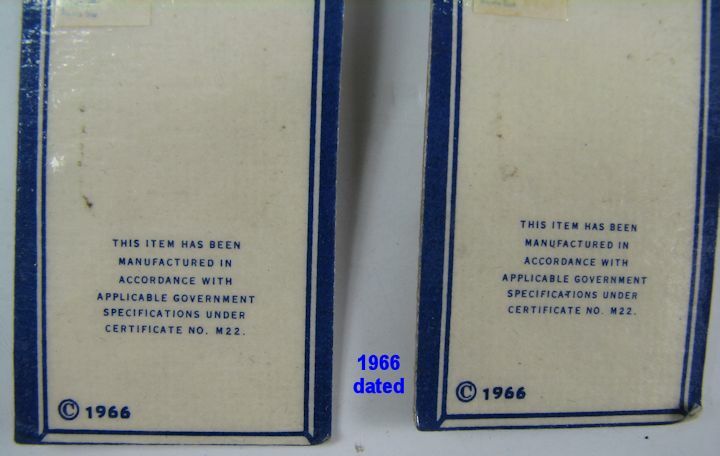 July 1967 and later. Slide-on. 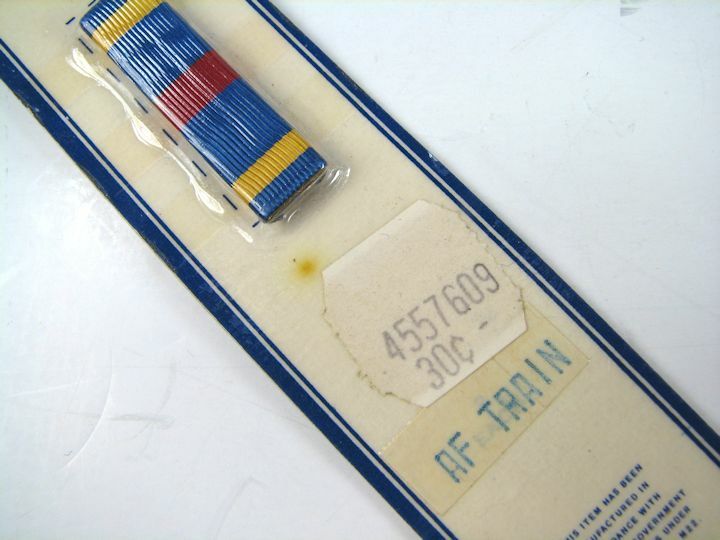 AIR FORCE COMMENDATION RIBBON BAR: Clutch back fasteners with the nuts. 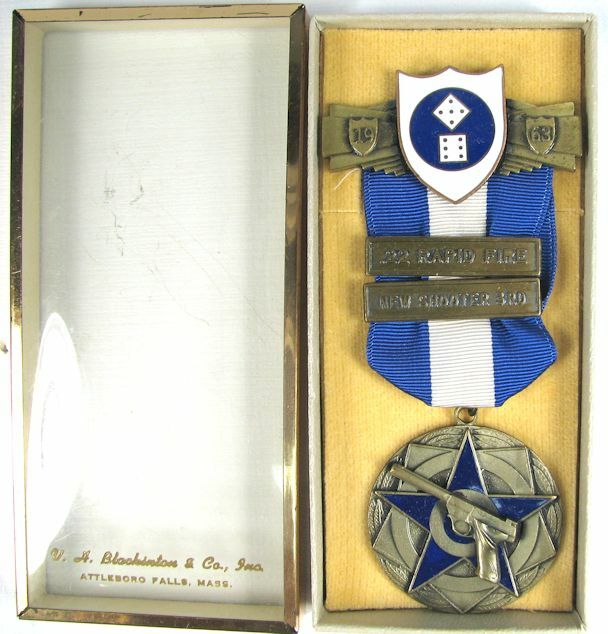 AIR FORCE LONGEVITY RIBBON BAR: Slide-on. 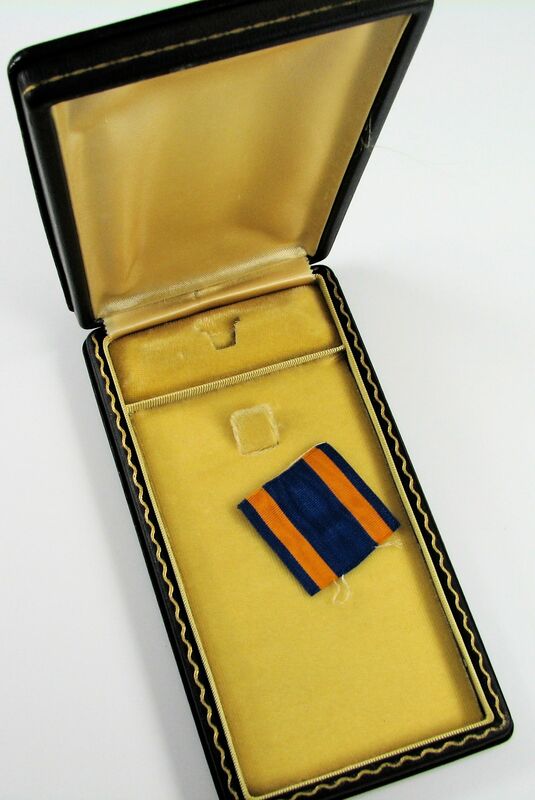 This ribbon replaced the uniform Service Stripes. 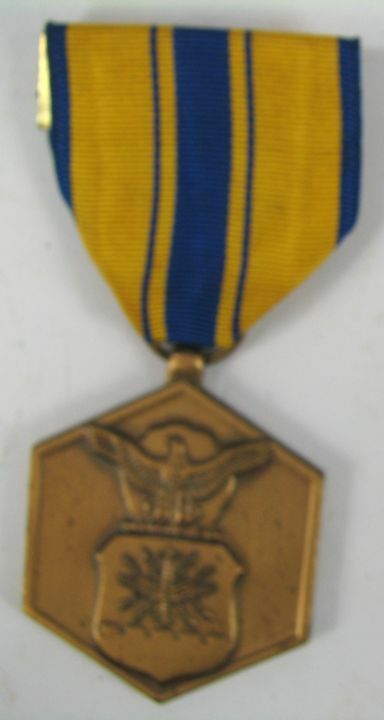 NAVY & MARINE'S OVERSEAS RIBBON BAR: Slide-on type. 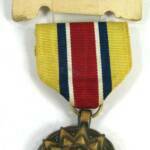 KOREAN WAR THREE RIBBON BAR: The Korean Service has a 5 battle Silver Star and two bronze stars. 3/8" size ribbons. Clutch back with the nuts. 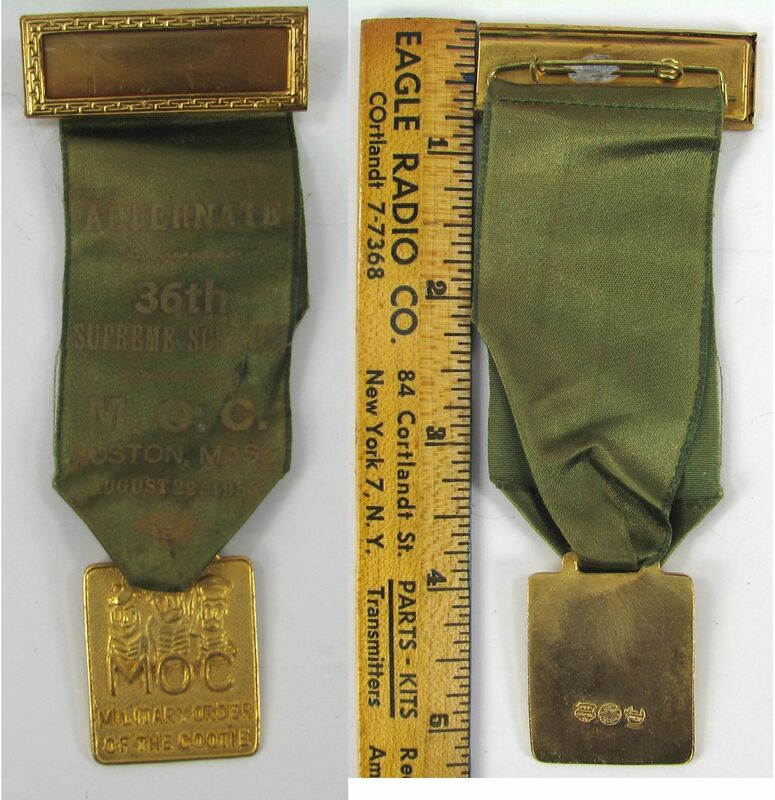 ARMY GOOD CONDUCT AND COMMENDATION TWO RIBBON BAR: 3/8" clutchback, with the nuts. 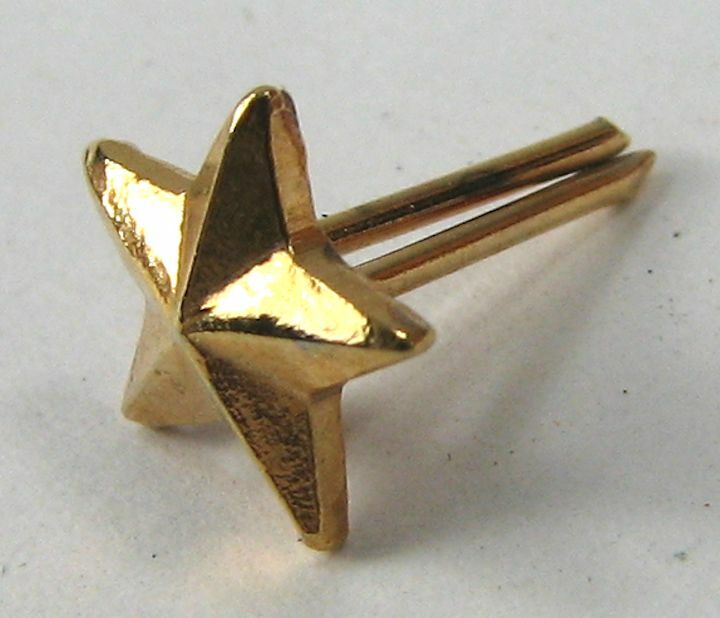 GOLD STAR: Never used. 5/16". US NAVY EFFICIENCY "E": Never used. 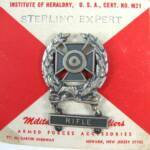 3/16"
MARKSMAN QUALIFICATION BADGE, STERLING by "KREW": Both pieces are marked STERLING and the top piece is hall marked "KREW". 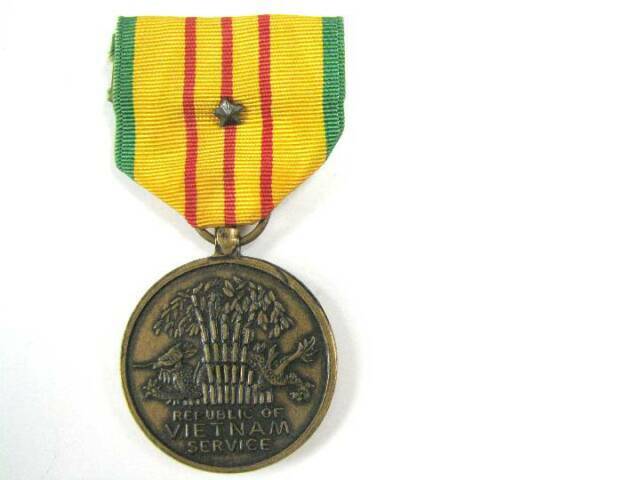 VIETNAM WAR SERVICE MEDAL: Good condition pinback medal with one bronze star. 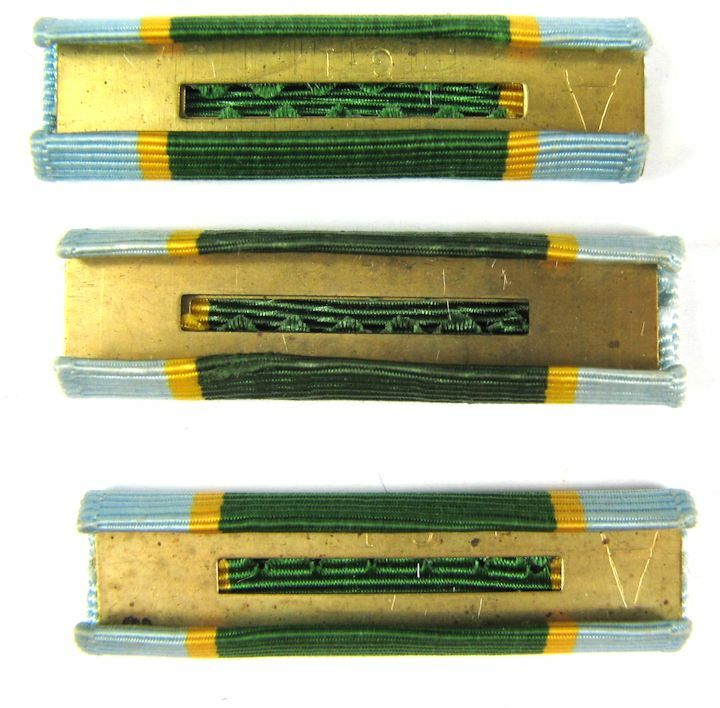 BRITISH MADE, 1/2" ARMY RIBBON BAR: Three ribbons. covered with plastic (wrinkled), 1/2" size. 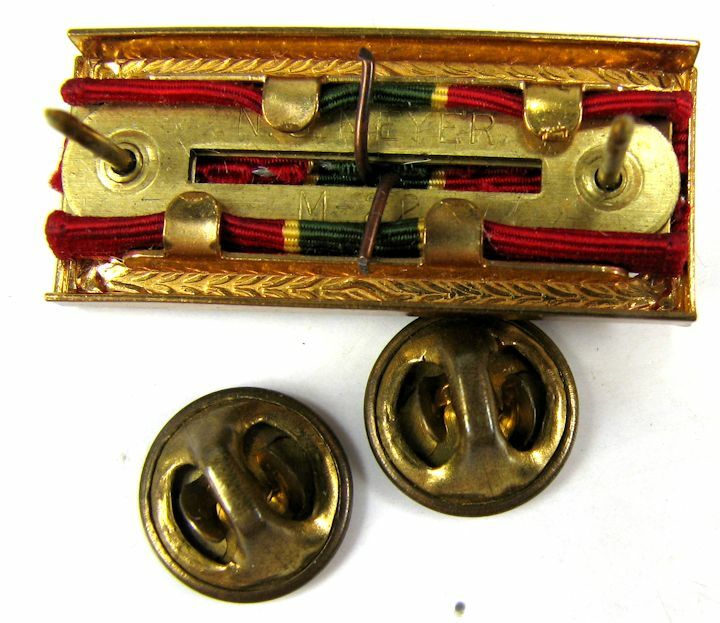 Pin back fastener looks like theater made, England ?. 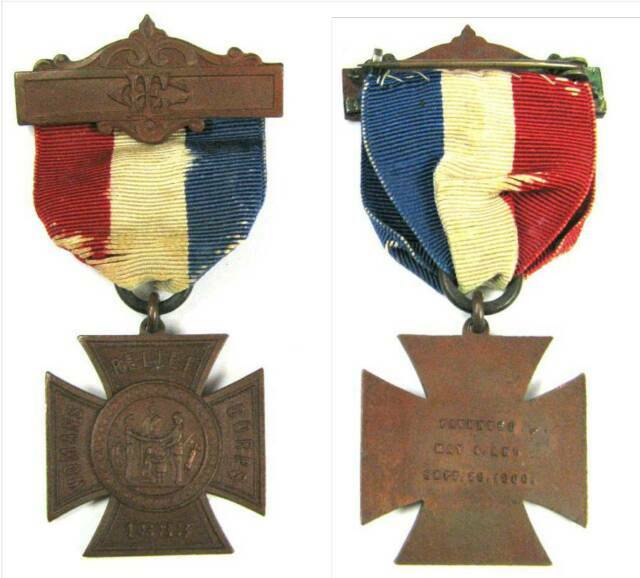 Ribbons are EAME with two stars/American Campaign/Good Conduct. 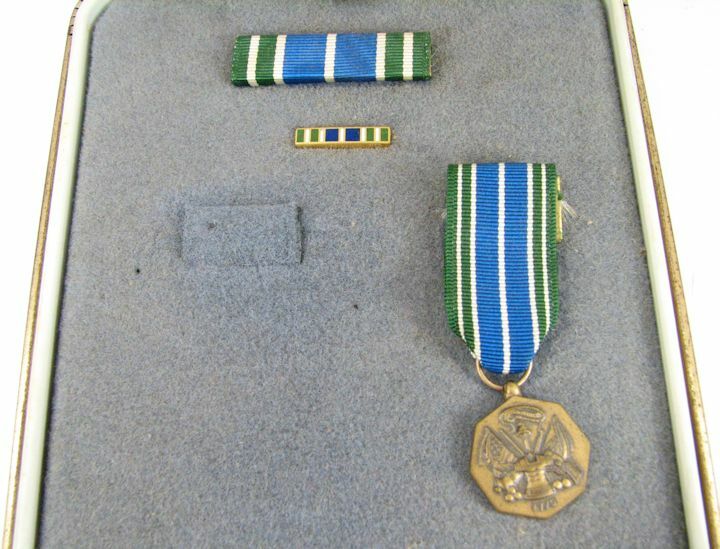 WW2, ARMY 3 RIBBON BAR: Consists of the Good Conduct Medal, 4th award; Occupation Medal for Japan Post-WW2 occupation and the National Defense, 2nd Award. 3/8" wide Army size. Clutch nuts included. Photo is out of focus but it is a decent looking set. As always, satisfaction guaranteed. 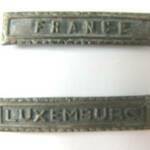 EAME RIBBON BAR: Nice PIN BACK ribbon bar for the European, African, Middle East Campaign.. 3/8" size. 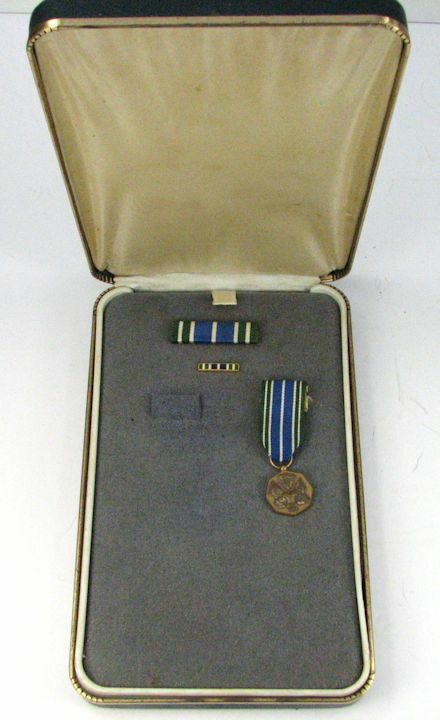 PHILIPPINE CAMPAIGN MEDAL, NUMBERED RIM: Army issued Campaign Medal, in the original box with the ribbon bar and lapel pin. 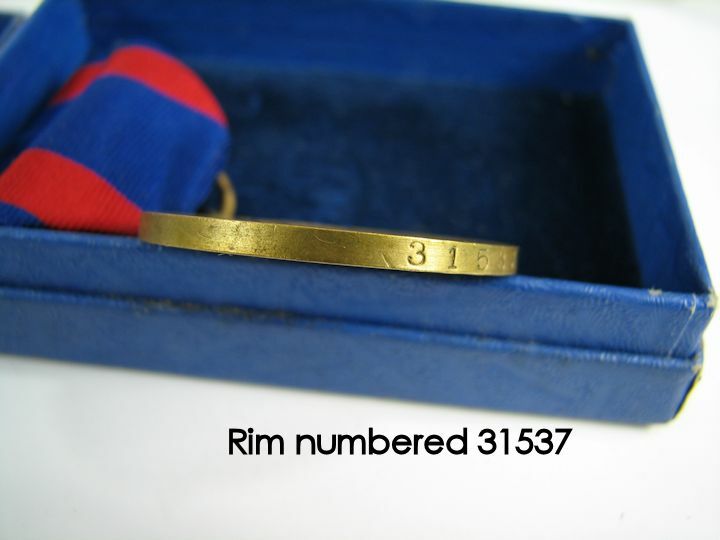 Box is numbered to the same number that is on the rim of the medal. Very nice set. 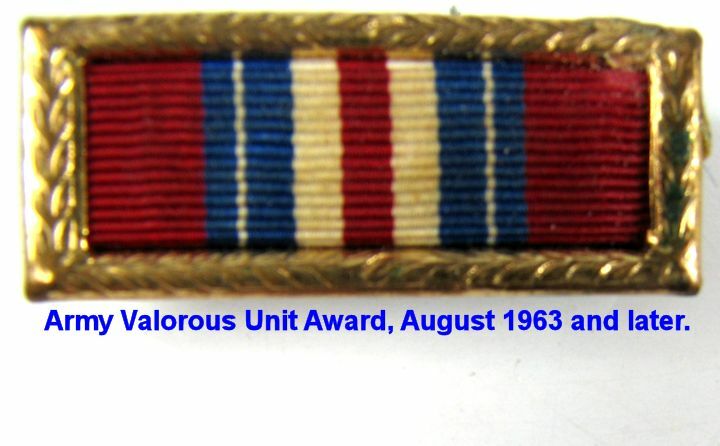 UNKNOWN RIBBON BAR WITH MANY AWARDS: It has four silver stars. One of the stars has lost the top finish but still is silver on the sides. Ribbon is soiled. 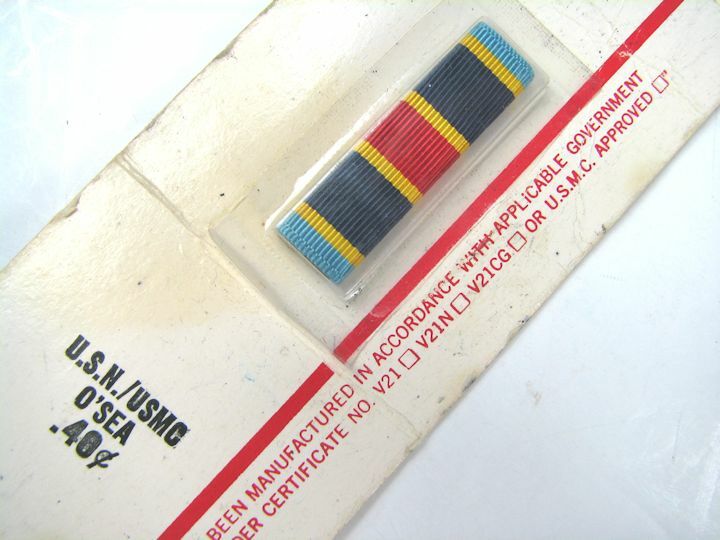 U.S. NAVY "EFFICIENCY" AND "SEA SERVICE DEPLOYMENT" RIBBON BAR: The Efficiency award will date 1976 and later. 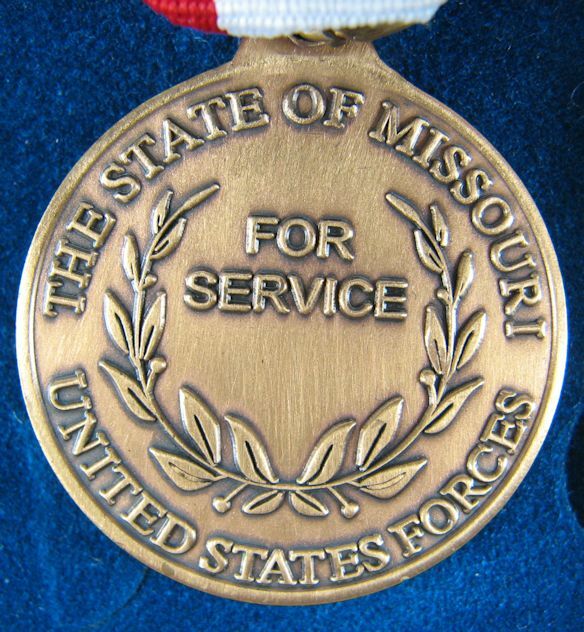 The Sea Service award will date 1980, retro to 1974 and later. 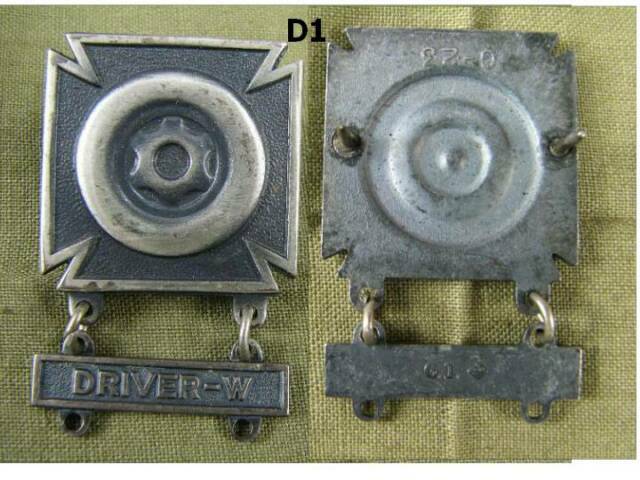 Mounting bar is marked "V-21-N" and "VANGUARD". Nuts included. 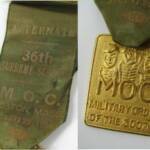 This ribbon set has a WW2 Victory; an Asiatic-Pacific campaign with 7 awards and a 1938-1950's Naval Reserve ribbon. 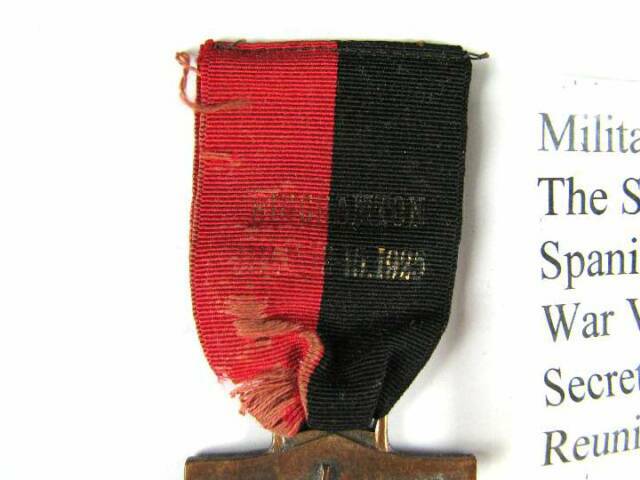 The Naval Reserve ribbon was replaced in the early 1950's by the Armed Forces Reserve (Thanks Kevin). Soiled. Complete with the clutch nuts. 3/8" size. 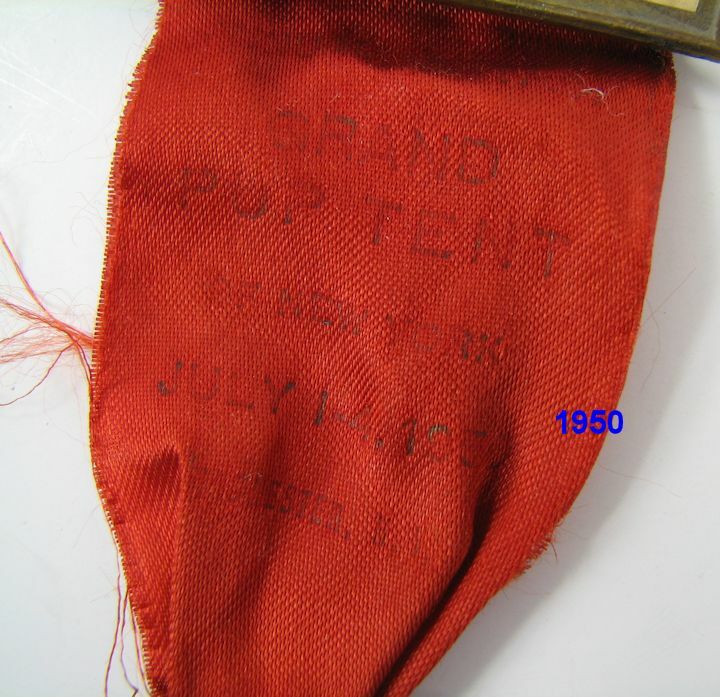 This ribbon set has an Occupation Ribbon; an American Campaign and a China Service. 3/8" size. Soiled. Complete with the clutch nuts. 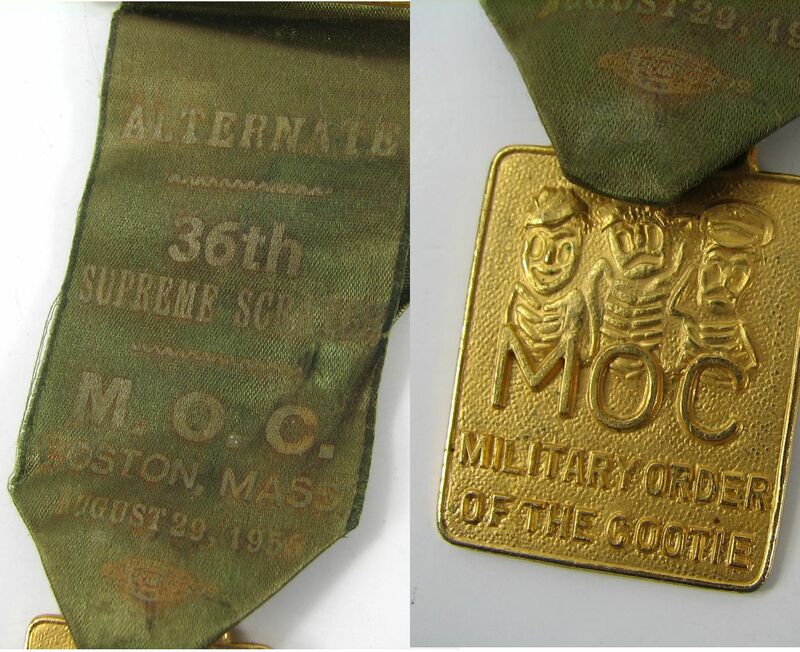 Consists of National Defense; Japan Occupation and Asiatic-Pacific campaign ribbons. The Asiatic-Pacific has light soiling the other two are bright and clean. The Occupation has different type of slide on mount. 3/8" size. 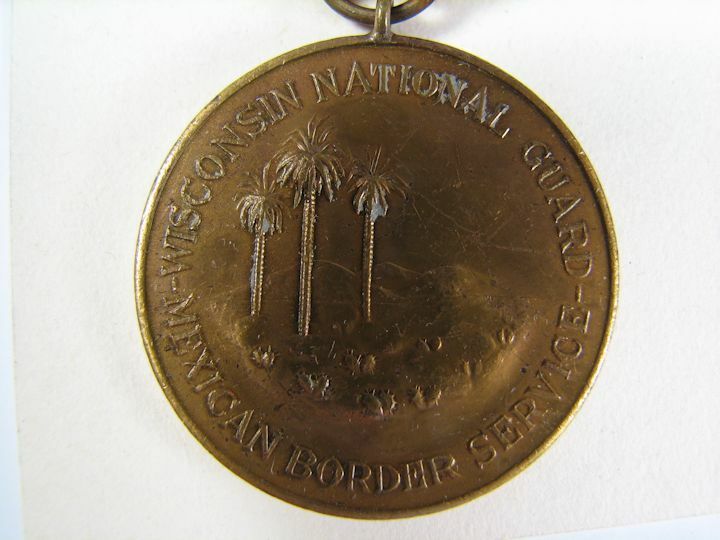 MEXICAN BORDER WARS SERVICE MEDAL WITH ORIGINAL PACKAGING, STATE OF WISCONSIN: This medal is an early issue having the wrapped brooch type pin back. 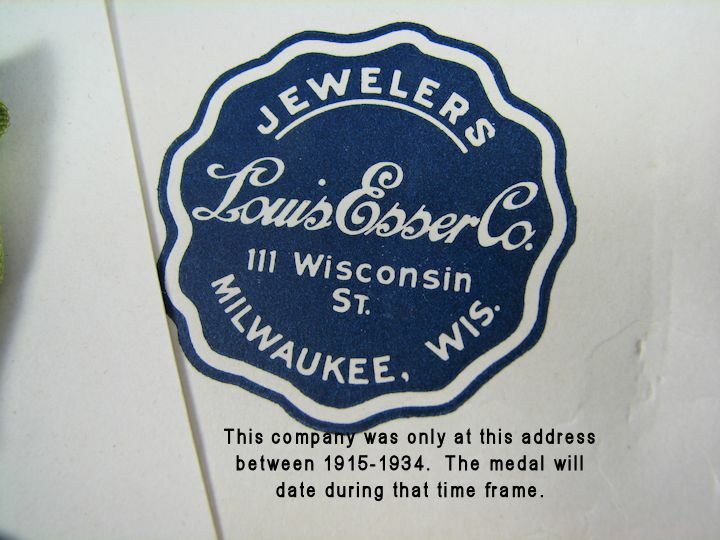 The selling Jeweler was only at this address until 1934 so the medal will date between 1917-1934. 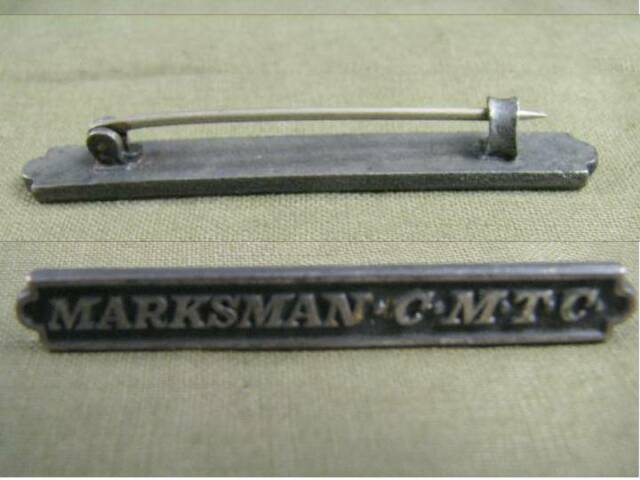 MARKSMAN QUALIFICATION BADGE: Both pieces marked STERLING. Pin back. Nice. 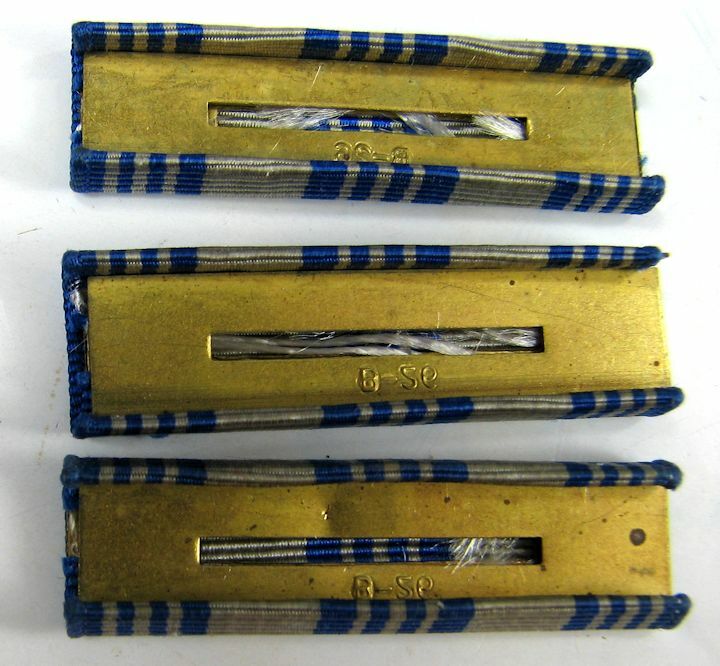 WW2, US NAVY RIBBON BAR: Three ribbon bar, 3/8" size. 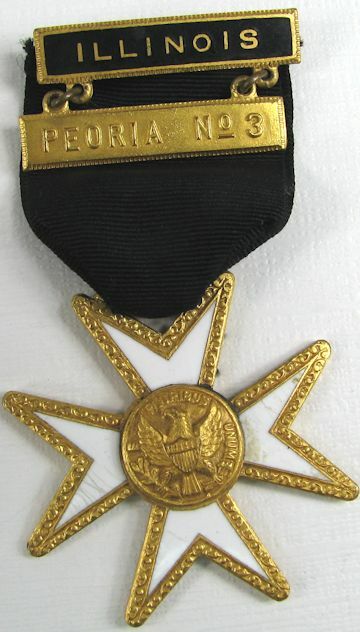 US Navy awards. 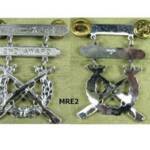 Left to right are: Navy Good Conduct; China Service and National Defense. Clutch back with the two nuts. Slight fading to the colors and very minor soiling. 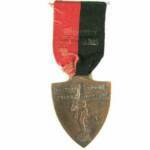 WW2, ASIATIC-PACIFIC CAMPAIGN, 1/2" SIZE: Navy or Marines. Pin back. USMC CHINA OCCUPATION:. 1/2" Marine size. Needs to be reinstalled on a pin bar. 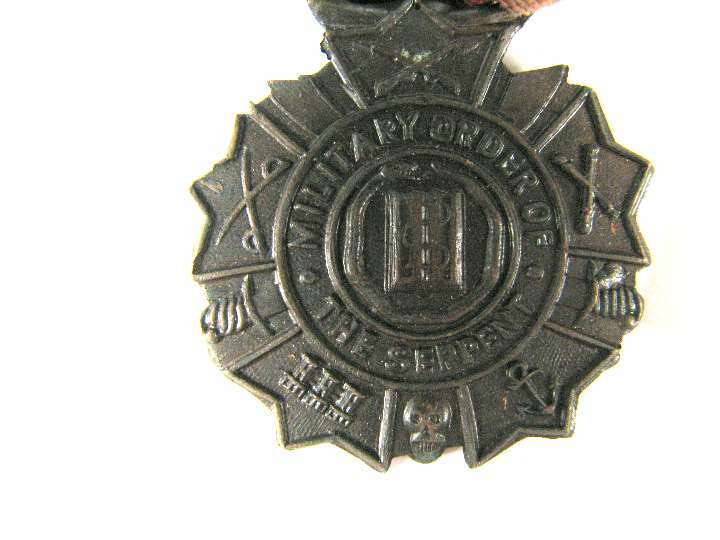 Worn by Marines in Post WW2 China occupation. 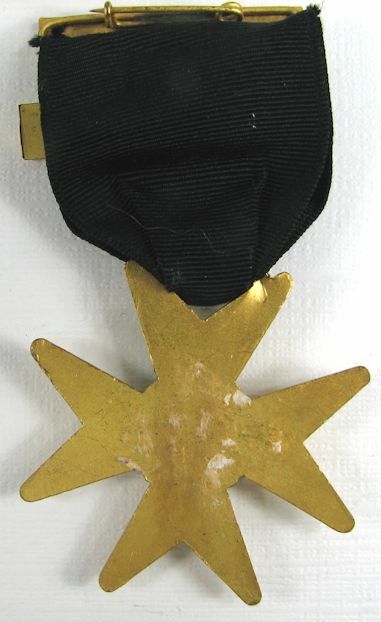 RARE MAKER, PHILIPPINE LIBERATION: With 2nd campaign star. Needs installed on a pin bar. 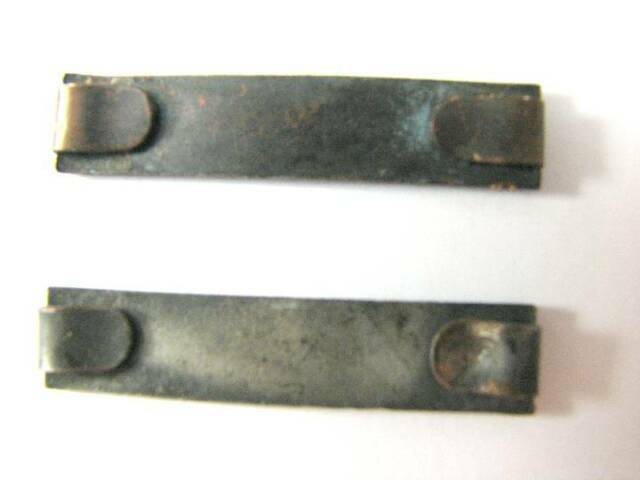 WW2 US NAVY 3 RIBBON BAR: 1/2" Navy size. 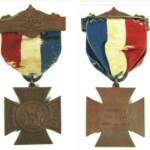 American Campaign; Asiatic-Pacific Campaign (2 awards) and Philippine Liberation. Covered with wrinkled plastic. Pin back. 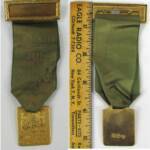 WW2, 1/2" USN/USMC SIZE TWO RIBBON BAR: An American Campaign and WW2 Victory ribbon. WW2 type flat face nuts. 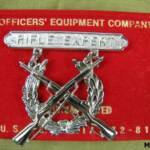 EXPERT RIFLE AND MISSILE QUALIFICATION BADGE: Clutchback with the nuts. Top part is Silver Filled and the two Bars are STERLING SILVER. Unusual "MISSILE" bar. 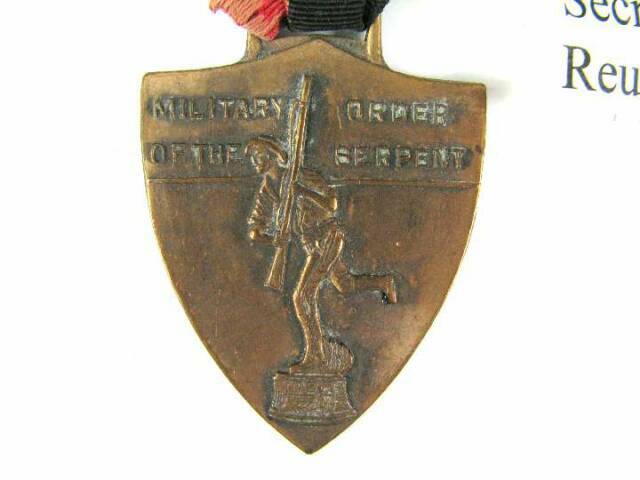 EXPERT RIFLE, CARBINE and MISSILE QUALIFICATION BADGE: Clutchback with the nuts. All 3 pieces are Silver Filled. Has the unusual "MISSILE" bar. 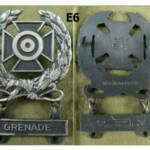 EXPERT FLAME THROWER: Pinback Expert Qualification Badge for Rifle and Flame Thrower. All are STERLING. 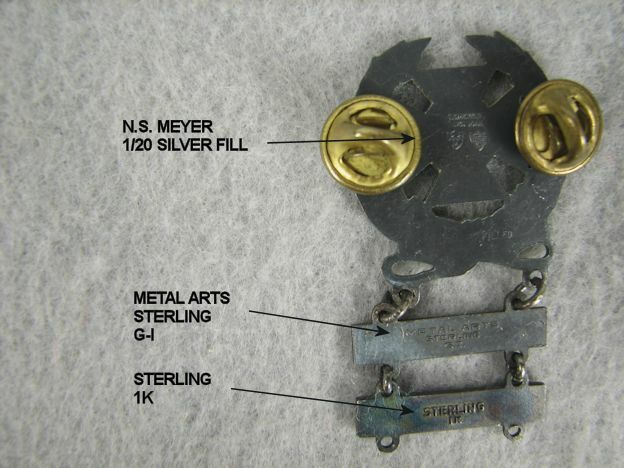 Made by BELL PRODUCTS and NS MEYER. Nice. JAPANESE A6M "ZERO" AIRCRAFT FACTORY. 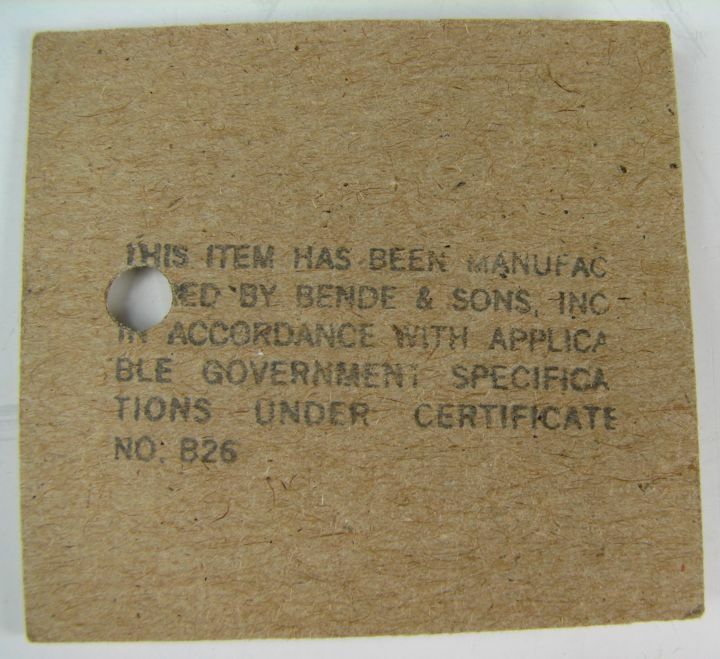 WW2, MITSUBISHI NAGOYA AIRPLANE FACTORY EMPLOYEE BUTTON: I bet you have not seen one of these before. WW2 Factory Employee who worked making the A6M ZERO Japanese Fighter Aircraft. 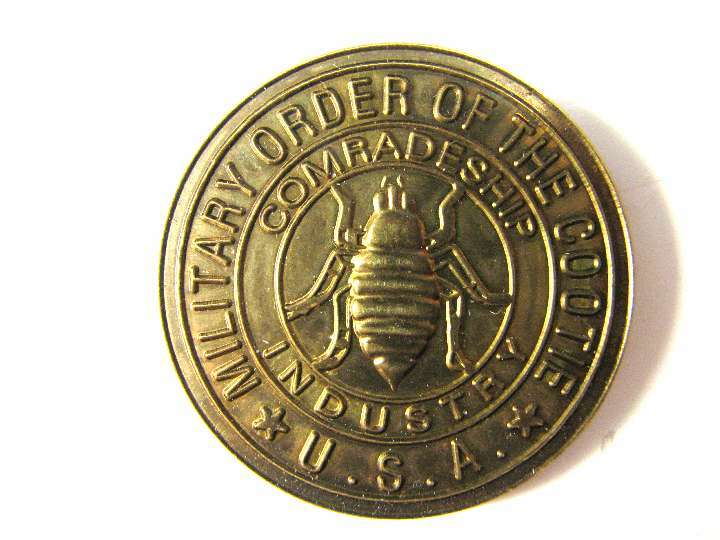 He gave the button to an American he befriended Post-War. Friend's name was Bil (William) and the Japanese man called him "Mr. William". More info on the photos. 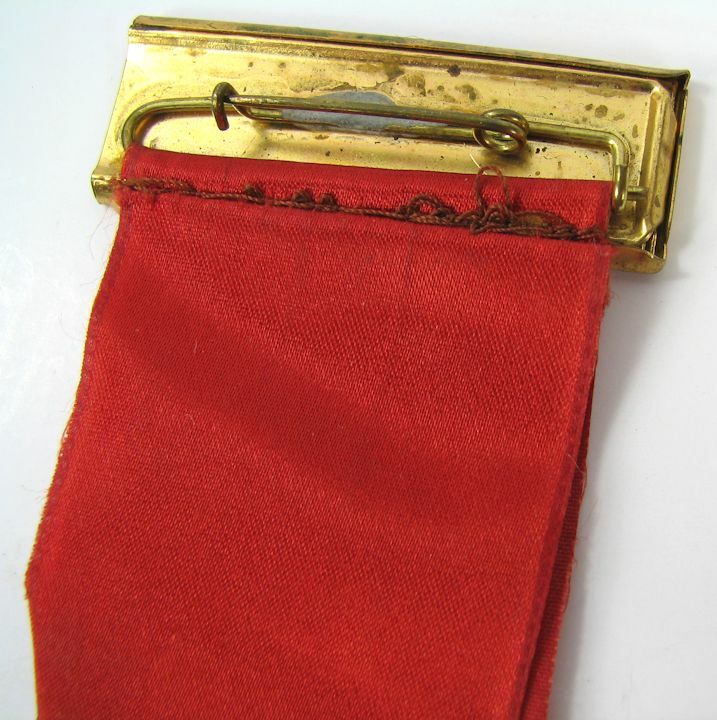 Plastic coated, 3 ribbon bar of 1/2" size. Made by GEMSCO and named "STAZON". Clutchback with the nuts. See the photos for more information. 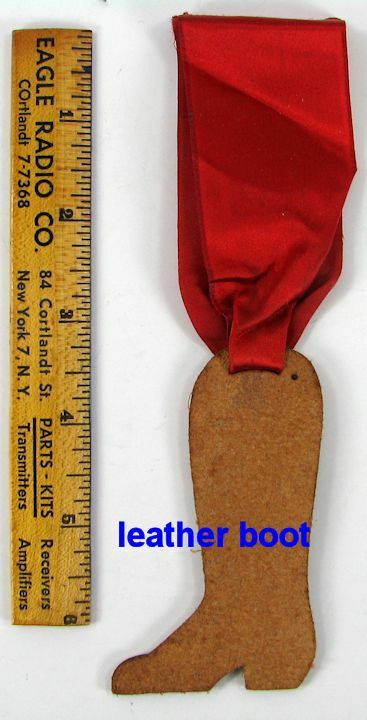 WW2, 1/2" NAVY SIZE. "STAZON" BY GEMSCO: Clutchback with the nuts. See the photos for more information. 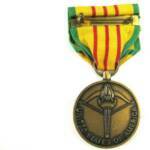 MINIATURE VIETNAM SERVICE MEDAL PENDANT: This is the pendant only, no ribbon or pin. 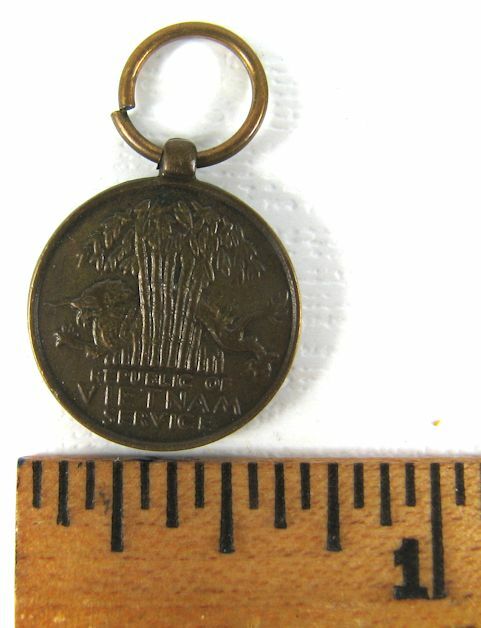 It is from a miniature medal for Vietnam War Service. With the ring still in place. Measures about 5/8" diameter. 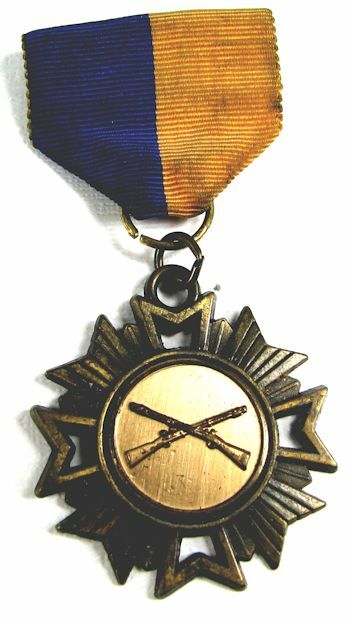 SHOOTING MEDAL, XI CORPS, 1963: Made by BLANKINTON. Full size 4" X 2". 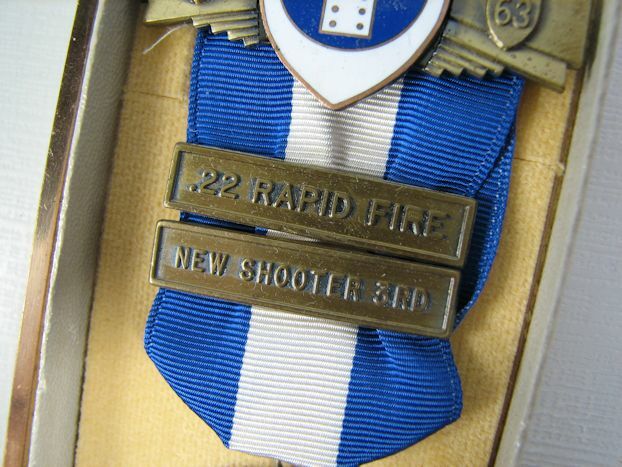 Clasps for ".22 RAPID FIRE" & "NEW SHOOTER, 3rd.". Excellent condition in original box. WW2 US NAVY. KOREAN WAR ARMY. 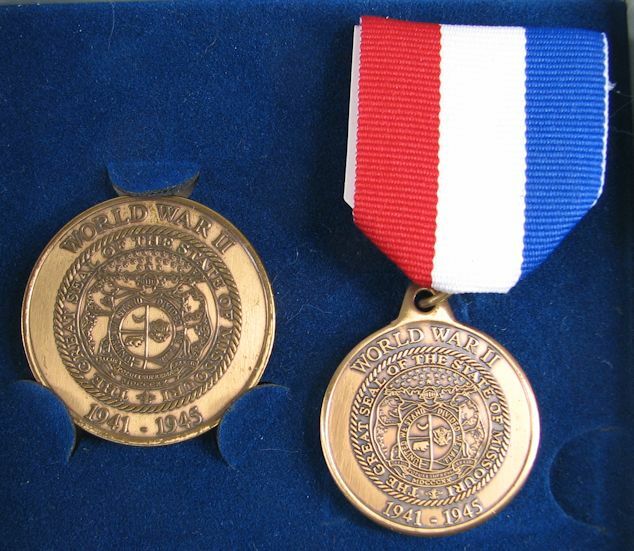 MEDAL GROUP: This large medal grouping is begging for research. I have had it for over 6 years and have done nothing with it so it is time to pass it on. What I think is that he was in the U.S. Navy prior to and during WW2. 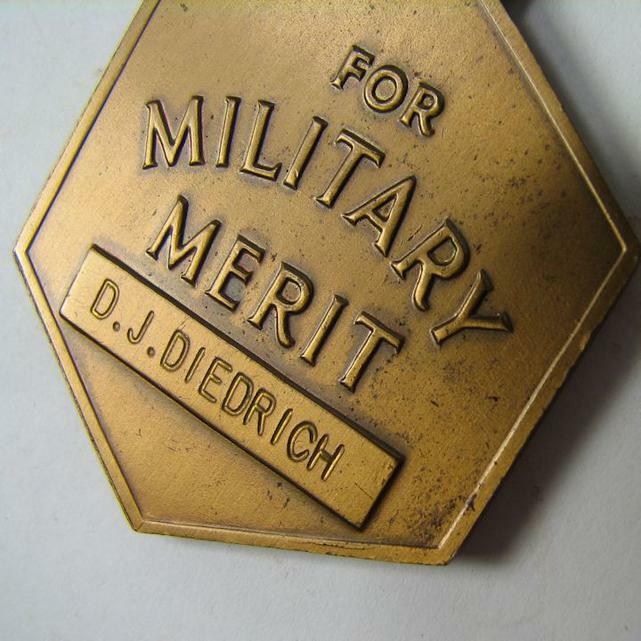 I conclude this because research found the "FLEET" clasp on the American Defense medal was only used 1939-1941. The NARA Army Enlisted Records then show him enlisting in the US Army in 1946. His Grave Marker seems to reveal he then returned to the Navy again sometime later. The ribbons span from WW2 through Korea. 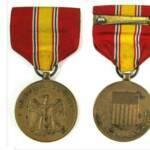 I speculate the Purple Heart, PUC and the CIB were earned in the Korean War. 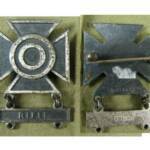 The CIB (Combat Infantry Badge) is marked STERLING and it has one STERLING clutch nut with it. 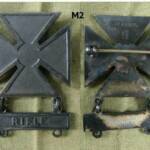 It has some loss of finish and is tarnished. There are 10 medals mounted on two bars with 5 medals on each mount. 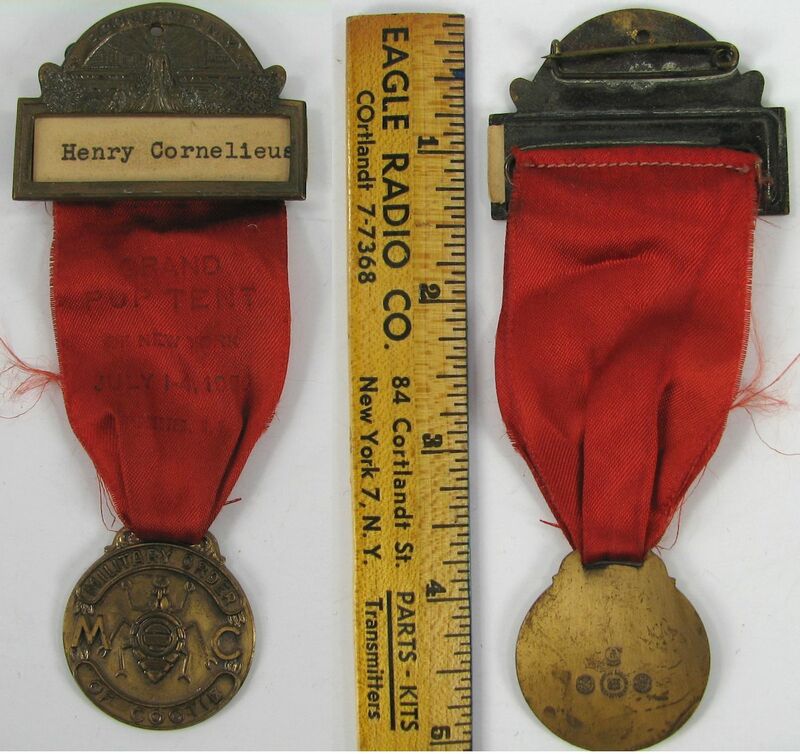 I have identified these medals with text on the pictures. 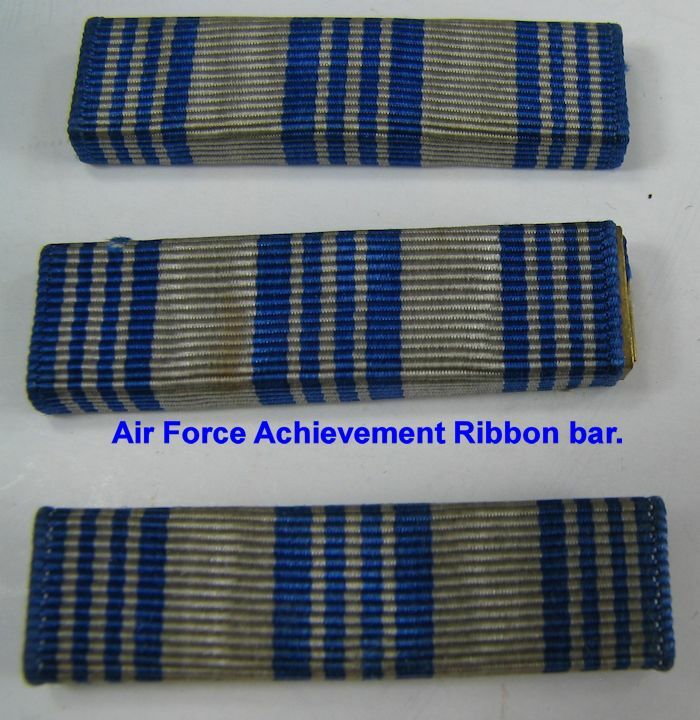 There are 4 individual ribbon bars with 3 ribbons on each bar for a total of 12 ribbons. There is a cloth embroidered ribbon grouping consisting of 15 ribbons. There is a "RIBBON AUTHORIZATION" card with his ribbons listed on the back of it. On the front is the Warrior's information. His full name was GILLETT LEO PONDER. GM3. 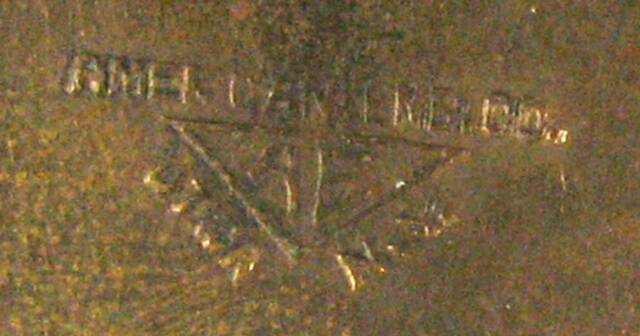 I enclose with this group a copy of his Grave Marker that shows him as a U.S. Navy GMG2. This seems to mean after his Army service he then went back into the US Navy. He is buried in Jefferson Barracks National Cemetery. His service records may reveal the nature of his Purple Heart and I hope the new owner completes the research on this man. I am going to price this at what I think the items would sell for as single pieces. 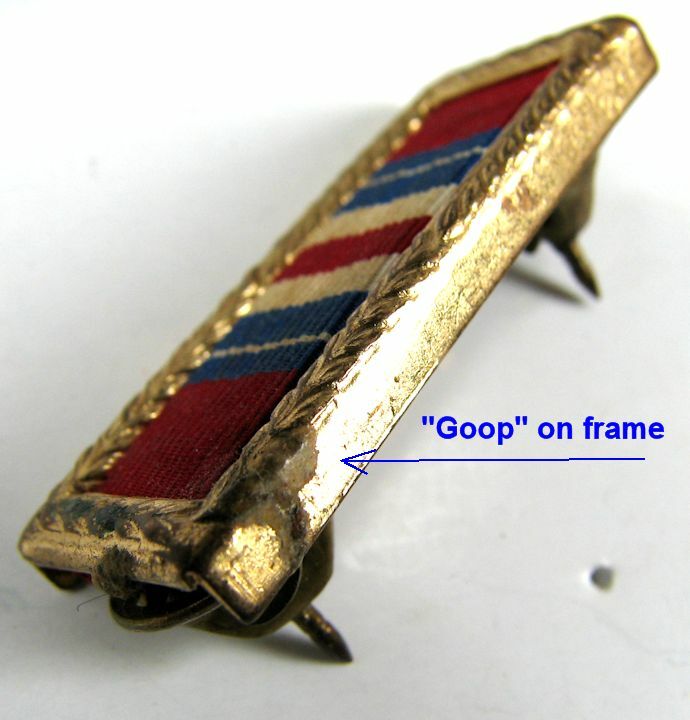 U.S. NAVY GOOD CONDUCT MEDAL: Later issue medal Pin has slight bend and the rotating part of the clasp is missing. It still fastens and will be just fine for display. 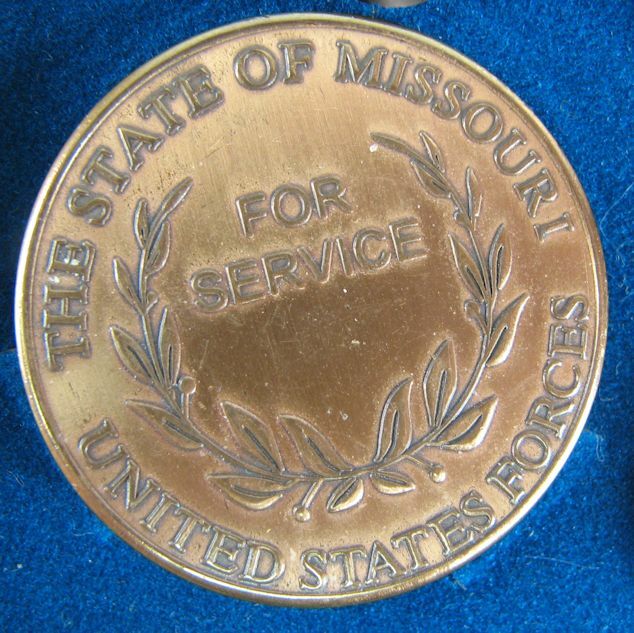 WW2 MISSOURI SERVICE MEDAL AND MEDALLION, BOXED: Nice medal and larger medallion in the original box. 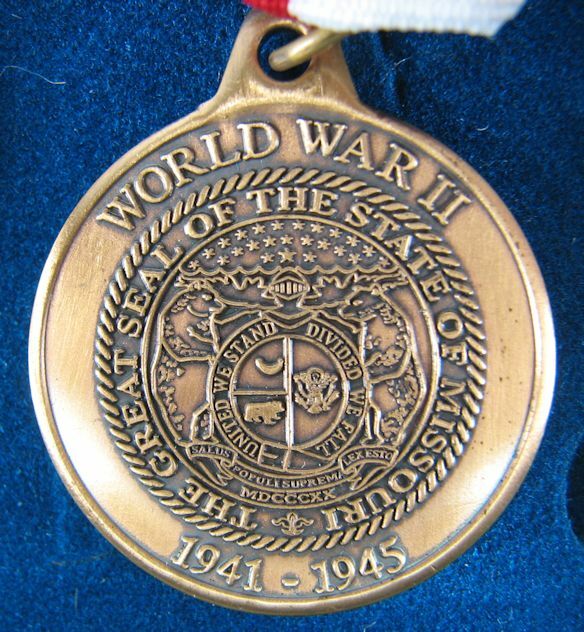 Awarded to Missouri Residents who served during WW2. 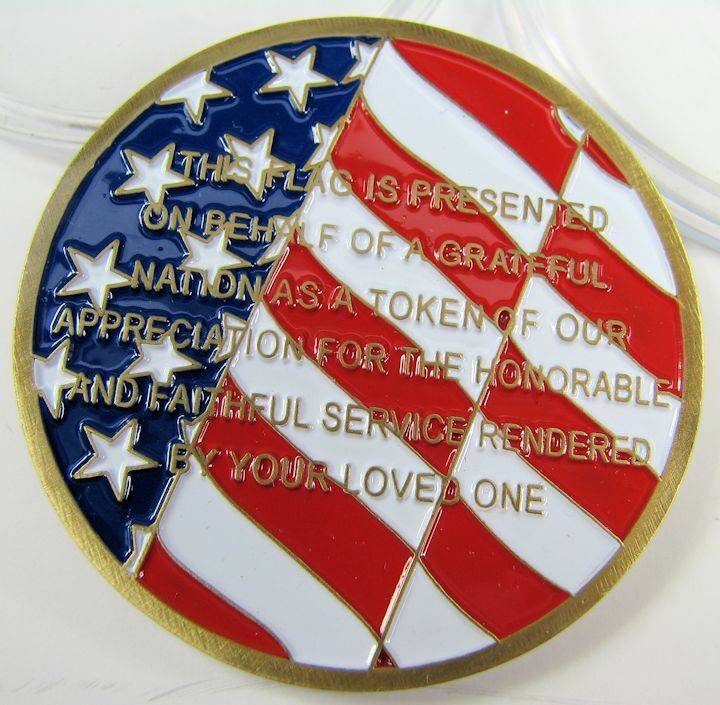 Size of large medallion is 1-1/2" diameter. 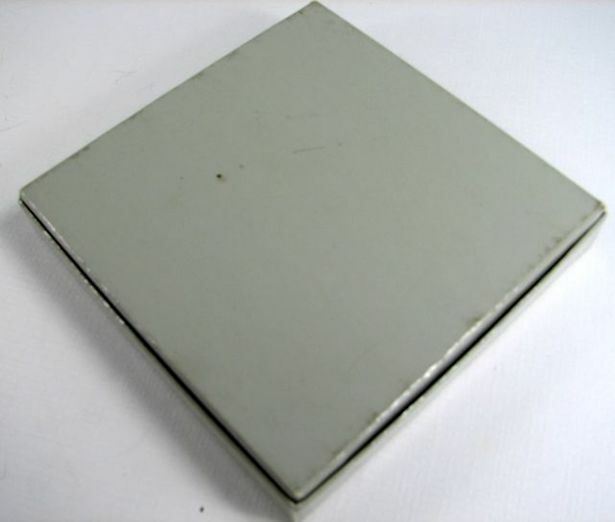 Box size is 4-1/8" square. It is a pin back and I see no problems with it. 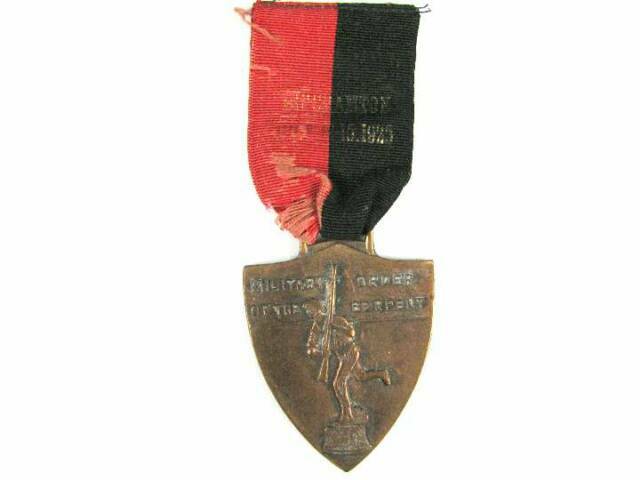 UNKNOWN INFANTRY MEDAL: Hallmarked on the back. Blue and gold ribbon is soiled. 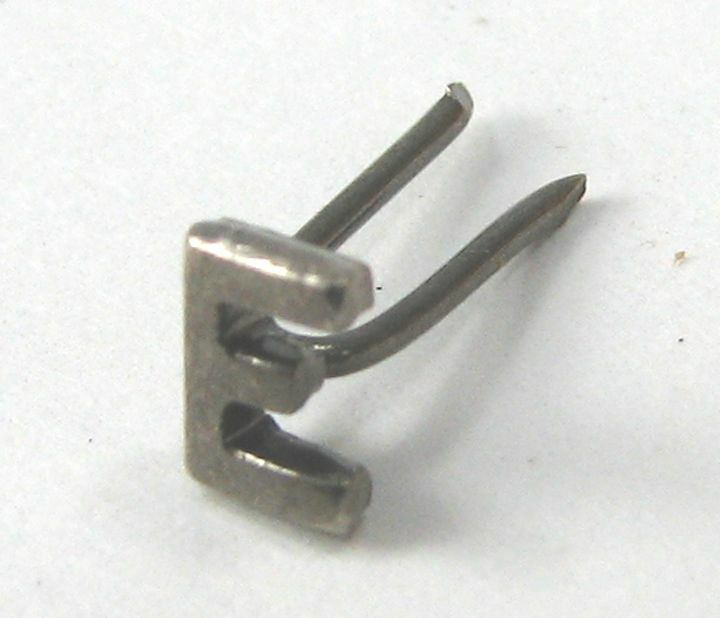 It is pin back. PEORIA, ILLINOIS No. 3: Not sure what this is. 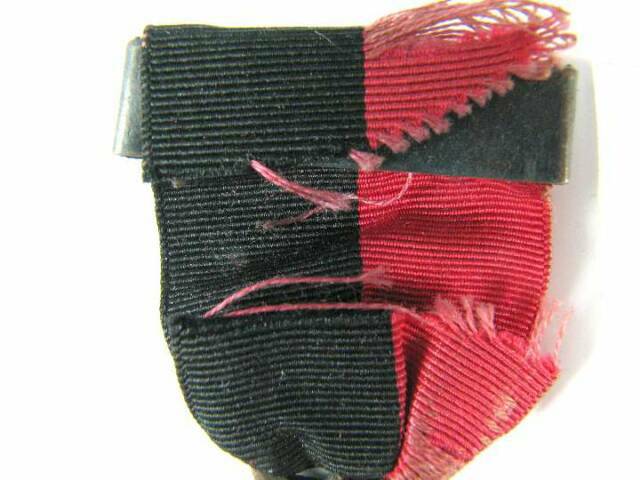 Some kind of a death or mourning ribbon/cross/medal. Pin back. No problems other than glue on back of pendant. It will clean off. 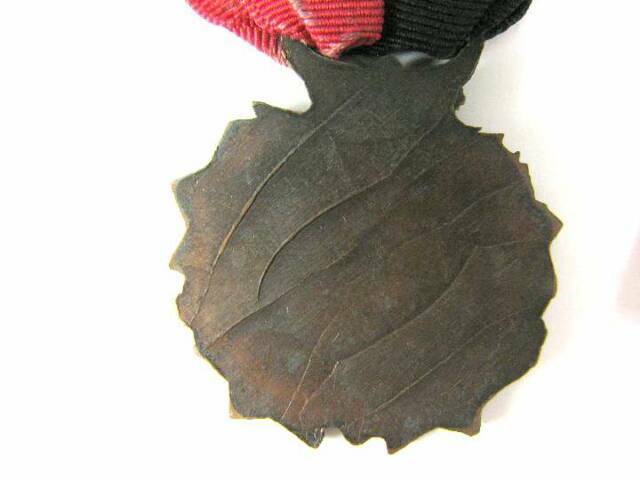 WW2 ARMY GOOD CONDUCT MEDAL: Pin back, slotted brooch. Not named. Soiled ribbon. 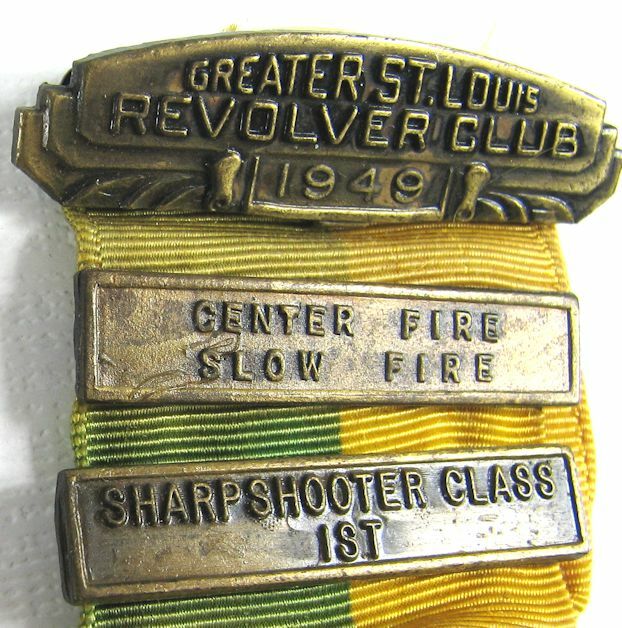 1949 SHOOTING MEDAL, GREATER SAINT LOUIS REVOLVER CLUB: Won the CENTER FIRE SLOW FIRE and the SHARPSHOOTER CLASS. Pin back. 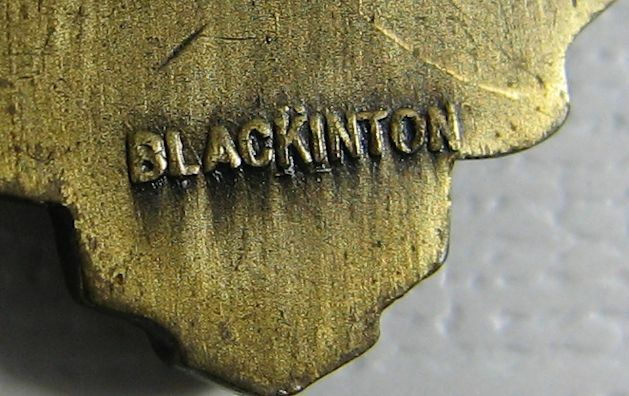 Made by Blankinton. Ribbon colors have faded.